I found something that might actually be useful to random folks on the internet! As of this writing, the quests to unlock warrior specializations are rather obtuse. 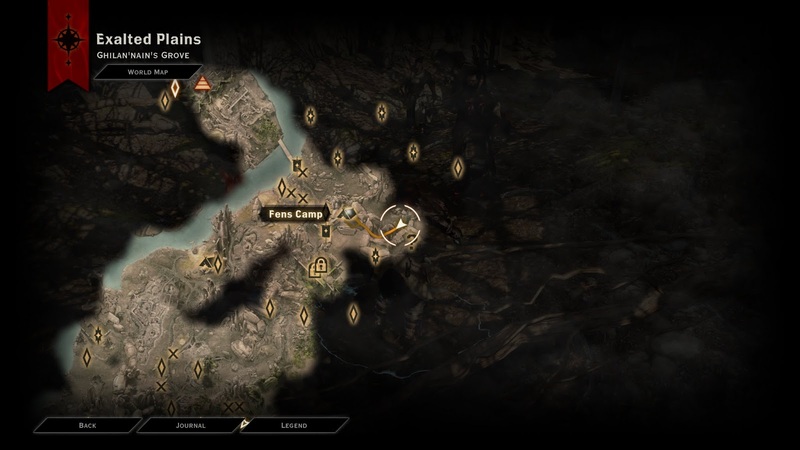 Unlike almost every other quest in the game, there aren't any map markers to show you where you need to go. 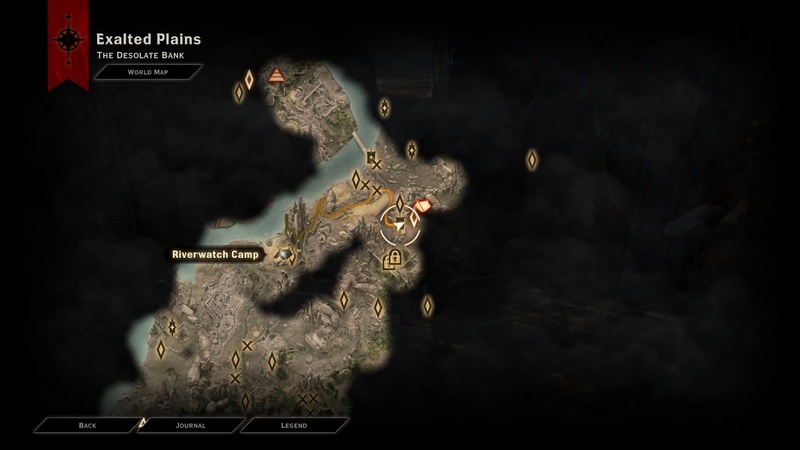 The journal description lists the areas where you need to duel other champions, but there's no way to view area names on your map either, and some of the areas are huge and laid out in a confusing way. After a few hours of wandering, I eventually found everything I needed, so I figured I'd share it here for anyone else who wants to become a Champion. Hopefully a future patch will add those handy map markers. All three duels are found on the Exalted Plains. 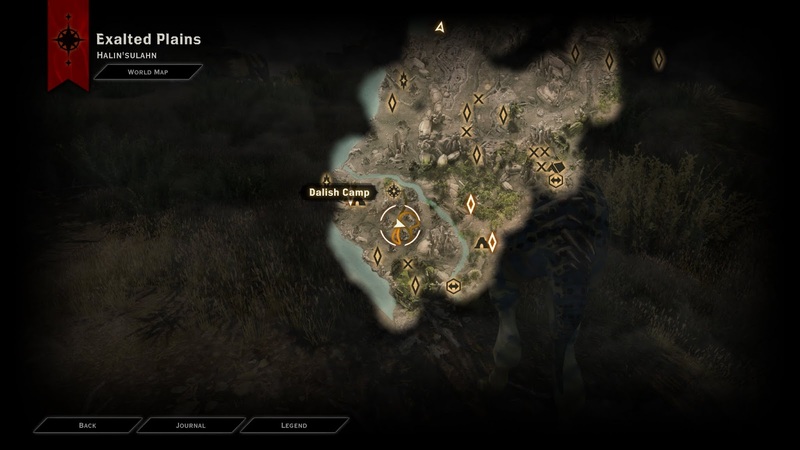 Halin'sulahn: Head towards the Dalish camp. It's in the hills between the camp and the graveyard. Desolate Bank: If starting from the camp, you'll need to actually leave the bank, rejoin the Path of Flame, then cut northward to go back to the Bank. Ghilan’nain’s Grove needs to be opened first. Find its location southwest of the undiscovered Fens Camp marker. Return to your War Table and complete an Operation to open up the way for 5 Power. Then, follow the northern edge of the Grove until you find the passage housing the champion. I threw together an album with these maps and a couple of in-game screenshots showing nearby scenery. Good luck! My rush through Thedas continues apace. I was fighting off a nasty cold this weekend, but the massive silver lining was that there was little reason to not play video games practically non-stop. During this time I crossed a noticeable threshold in the game, when my overall attitude shifted from "Wow, this game is great!" to "OH MY GOSH THIS MIGHT BE THE BEST GAME I'VE EVER PLAYED!" I'm still trying to keep it low key and reserve judgment, since there's a lot of game left to go, but boy, I'm sure digging it something fierce. DAI excels more than most in being a game for everyone. In an unexpected way, I find myself reminded of my swift infatuation with Civ IV, which had multiple systems that could aid your empire, all of which were helpful, none of which were necessary. For example, if you enjoyed religion, you could invest resources and attention into founding and spreading your faith(s), which would give significant benefits to your civilization; if you ignored religion entirely, though, you could still do well at the game. That's the same vibe I'm getting from DAI. There are a lot of fantastic, well thought-out systems: crafting, exploration, strategic decision-making at the War Table, mini-games and puzzles. If you're a completionist like me, all of these are fun and worth your time. If you don't like some of them, though, you don't need to focus on them. There are sources of rewards from lots of places. For example, I really enjoy the discovery/harvesting aspect of the game: while wandering around, you can look for herbs and metals, which can then be used in crafting. If you want to craft, but don't want to harvest, that's fine! You can order your Inquisition to gather supplies for you. Granted, there's an opportunity cost here - if they weren't gathering supplies, they might be raising gold or completing other missions - still, it's a fantastic design choice. One of the best instances of this design, though, is gearing. As in all RPGs, you can loot some equipment from defeated enemies or treasure chests, or can buy equipment from stores. As in MMOs, you can also choose to craft gear. Crafting requires a bit more time and effort - you must discover schematics, harvest resources, and then visit a crafting station - but it's rewarded well, since crafted gear is generally of higher quality than even the best gear you can find. Again, though, if you don't want to craft, you don't have to; instead, you'll have more incentive to pursue War Table missions that might result in powerful Unique gear. And, you can spend time micro-managing slotted equipment upgrades to min/max your stats; or you can ignore this fiddly stuff, and just focus on getting more powerful base gear. All of these things are fun. If, like me, you do everything, then you'll be able to outfit everyone in your party (including those you don't generally travel with) with super-high-quality gear; but if you ignore some of this, you'll still be able to find good equipment just in the course of playing the game. Perhaps thanks to my focus on gear, I've largely neglected the development of consumable items like potions and grenades. However, it looks like this would be an alternate path to success. As in most RPGs, you have a lot of basic fights that aren't much of a challenge, and then a few boss fights that test you more severely. With high level gear, you blast through the trash easily, and then face a stiffer challenge on the boss fights. If, instead, you had lower-level gear but more consumables, you could still beat the trash opponents, and break out your powerful potions and grenades for the fewer difficult fights. That would be a totally valid way to play, and I love that I can recognize the validity of that strategy while not feeling like the game is forcing me to do it. I should note here that I'm playing on Normal. It's been a smooth ride so far; I don't think I've died yet, although I've needed to retreat from perhaps three fights so far (Rift fights against level 12 enemies while I was still around 8-9). I'm sure that I'll play as Hard next time. I'm having a lot of fun with the combat style; I'm playing in real time, with zero pausing, kind of as training for multiplayer. I haven't had to use the tactical camera or non-healing potions yet, so I'm sure that if I made more use of those, I'd be able to tackle the higher difficulty level. One change that initially threw me, but I've come to love, is the separation of abilities into two separate sections. As in most traditional RPGs, as you play the game you gain experience; when you gain enough, your character levels up, and you can unlock a new combat ability. 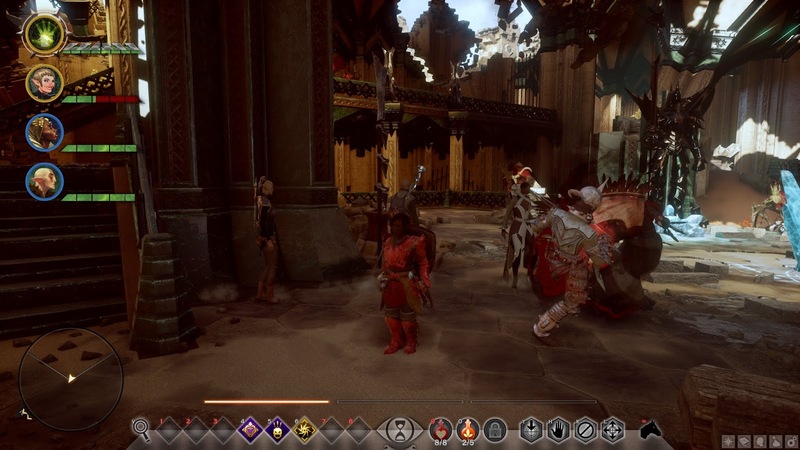 However, you aren't just leveling up your character: You're also leveling up the Inquisition. This happens much more slowly, and enables an entire separate set of abilities. These aren't combat skills: rather, they're perks that can help with things like exploration, crafting, mounts, and dialogue. The main reason I love this is because it eliminates the classic tradeoff I have when building a player character: given the option, I will always invest heavily into soft skills like persuasion and lockpicking early, which gives me access to more content but weakens my character. Now, thanks to this clean separation, I can still make decisions about how I build my character, but I'm not trading off combat skills for social/thief skills. It's also nice because you can mix and match across classes better based on your roleplaying concept and what you enjoy. Aztar is a warrior, but a charismatic one, and her first priority was acquiring knowledge that would help her to persuade others. However, other warriors might choose to focus on their riding earlier, so they can swiftly and safely cross broad swathes of terrain; or they might order the Inquisition to gather tons of supplies for them, because they want to craft but don't enjoy harvesting. Similarly, a rogue could pick from any of those same choices: they're not locked into a rogue-specific set of soft skills. Great design! The engine looks freakin' fantastic. They don't seem to be making much use of Frostbite 3's destructible terrain features, but I don't really miss it that much. So much of the in-game stuff looks cinematic, and the proper cut-scenes even more so. It's also stable as heck. I haven't crashed once in the many, many hours I've played. (That doesn't hold true for multiplayer, which I'm abandoning until a patch comes out, since I abruptly crash to desktop every few matches.) On the whole, the game feels really solid. The only major in-game bug I've encountered so far is a point where my inquisitor's voice changes after meeting another major character; apparently that's a widespread bug, so I'm sure it'll get patched soon, and fortunately there's so much other stuff for me to do that I'm fine with leaving that quest line alone for now. Granted, there are occasional minor clipping issues, and every once in a while characters get "trapped" making repetitive motions... but given the vast amount of stuff going on in the game, it's very easy to forgive these imperfections. I haven't killed any dragons yet. Soon! Things I Love About Inquisition #174: After the first three party members, whenever you recruit a new follower, they won't have spent any of their ability, points, letting you build them however you want. I was astounded and delighted by this; ever since Baldur's Gate 1, I've gotten used to dealing with mediocre builds from new recruits, which often results in me either rushing to recruit them ASAP so the AI doesn't screw them up too badly, or else just abandoning them in camp as a lot cause. There's a reason why one of the first mods for any BioWare RPG tends to be "reset companion skill points." In Inquisition, it feels so good to be able to shape a follower to fit your party, rather than trying to figure out how you can munge your party to accommodate a new companion. There's a general tip that was loudly spreading online this weekend, so I'll rebroadcast it here: Leave the Hinterlands! An early region of the game as a ridiculous number of side-quests and other fun stuff to do. Definitely feel free to bop around and do as much as you want; but the instant you start feeling slightly bored, head back to your War Table and advance the plot. The most important reason to do this is to start unlocking additional followers: not that there's anything necessarily wrong with your initial trio, but things get more entertaining once you get a wider variety of voices on your side. 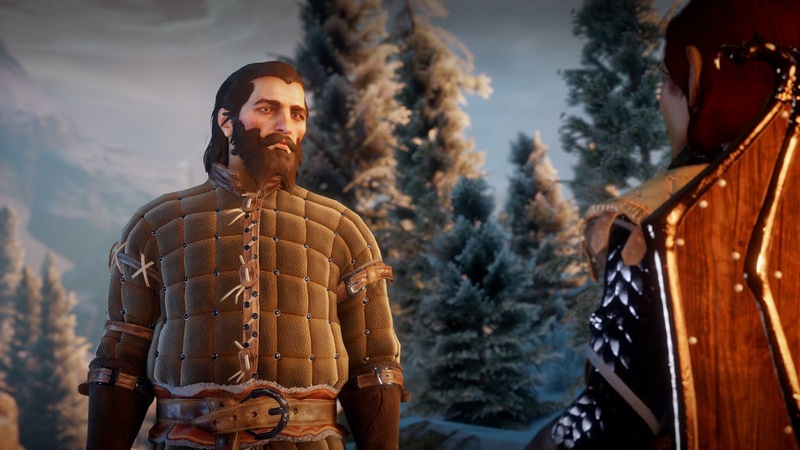 You can always come back to the Hinterlands later, it isn't like Lothering in Dragon Age: Origins where you could permanently lose some companions and side-quests if you got too far in the main story. Also: if you do miss stuff, you don't need to worry too much. Later in the game, you get access to a shop that lets you purchase codex entries, schematics, and other one-time items that you might not have picked up in one of the few time-limited maps. There's a nominal fee for purchasing each one, and you don't appear to get XP for codex entries acquired this way, but still, it's a fantastic help for OCD-ish players who worry that they will permanently miss out on Important Stuff if they don't go over every square inch of Thedas with a fine-toothed comb. There are so many things that I love about this game. Another one high on the list is how the world permanently changes in response to your presence. In one obvious example, in certain war-torn regions you might find roving bandits and renegade soldiers. After dispatching with them and claiming the land for the Inquisition, your own organization will move in. You'll see travelers on the road, refugees huddled by the fires that used to support outlaws, and more game in the woods. An even more evocative motif, though, is cave exploration. In the traditional fantasy RPG, an adventurer ventures into a cave. He carries a torch, using its light to explore the deeps, fight off monsters, discover treasure, and then find his way back to the surface. In Inquisition, though, exploring a cave isn't just about getting loot: subtly, it's about making the world a better place. The inquisitor carries a torch, but she uses this to light other torches within. She slays the dangerous monsters that have been terrorizing the populace. When she leaves, the cave is changed: brighter, safer, a place of torchlit beauty rather than pure darkness. I've been thinking a lot about the level design aesthetic in Inquisition. It's really good, and incredibly varied, across multiple regions. The hinterlands are dense in population, resources, and quests. Practically every step you take is bursting with possibilities. It's wonderful, if occasionally almost overwhelming. The Storm Coast, in contrast, is much quieter: there's a lot of activity down by the water, but once you head up into the hills, you can travel for a long time without encountering any friends or foes, or even a lot of vegetation or minerals. 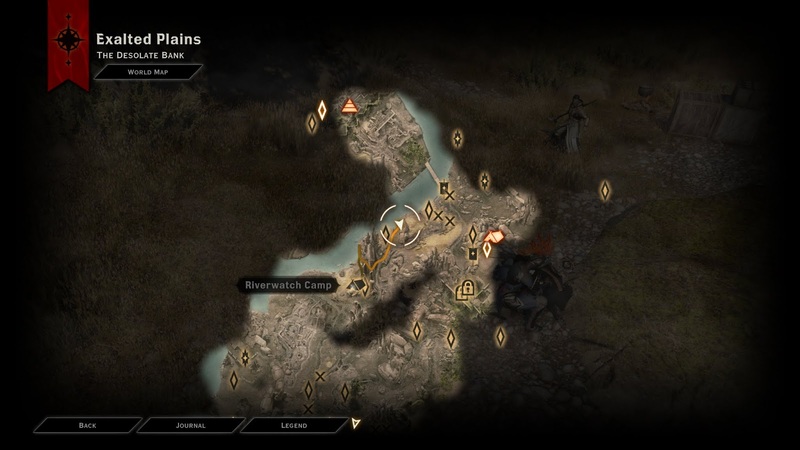 The Fallow Mire is much more focused than either of the first two: it feels closest to a traditional Dragon Age map, pulling you along a single strong through-line across the map, with periodic chances to stray for a sidequest or two. And the Western Approach is a huge desert, looking much like Red Dead Redemption, with a lot of open space for movement, broken up by mesas and ridges. And, each of them has their own visually distinctive environmental atmosphere. The Hinterlands are gorgeous: sunny, blue skies, green foliage. The Fallow Mire is rainy, gloomy, with periodic lightning strikes. The Western Approach features a blazing sun overhead and clouds of sand underfoot. It's a really interesting contrast to Elder Scrolls games, which have done a great job at simulating a complete weather cycle: the sun rises and sets throughout the game, clear skies will gradually grow cloudy and then turn to rain, stars slowly grow visible as the sky grows darker, and so on. It adds a lot to the realistic aspect of these games, and also makes moments with fortuitous atmospheres seem more special. If you happen to crest a mountaintop just as the sun starts to rise, you'll feel special, knowing that you got lucky to arrive here at just this time, and also knowing that few other players will experience the same thing. But, it also means that there's no particular link between the world around you and your own story. 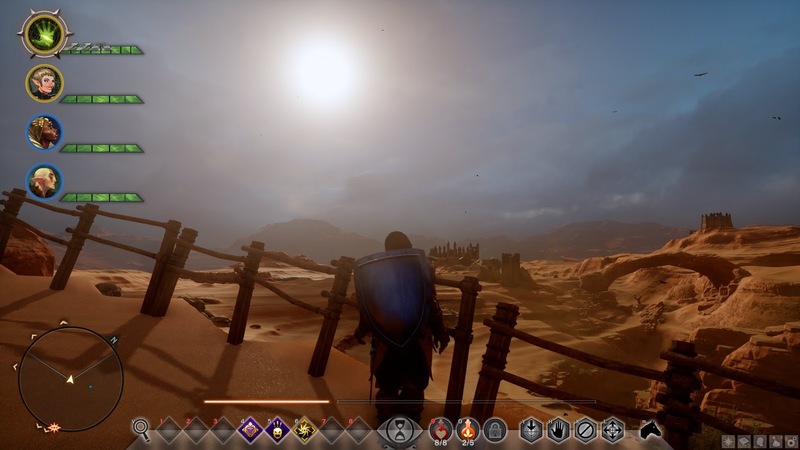 As usual, BioWare focuses more on the dramatic and the cinematic, aligning its designs to support the story rather than allowing them to exist for their own sake. There's a thunderstorm in the Fallow Mire because it looks cool, and the blue fog makes the swamps look awesome, and the ruined castle looks incredibly dramatic when lit by lightning bolts. It's a different design decision, and I don't think I can say which philosophy is better, but BioWare certainly succeeds at what they're going for here. I'm really happy that this game launched without any day-one DLC; I'm sure that some is coming, and that's great, but it'll really help those things feel like extras and not stuff that was "held back." Here's my own personal wish list of stuff that I would be willing to pay a few bucks for. An alternate casual outfit for my Inquisitor to wear when lounging around home. And here's stuff that I'm really hoping makes it into a patch. Permanent mouselook option on PC. I've learned that it's far better to just use F for all interactions, which means that I'm permanently holding down RMB for the whole game anyways. A key command to toggle the HUD on or off, for better photo-taking opportunities. Allow rebinding to more keys and (particularly) mouse buttons. Eliminate opening the debug console by pressing tilde. I've liked previous games where this is only enabled if you pass particular launch arguments into the game. Fixing the ability to add activated abilities to the toolbar. Better inventory management screens on the PC; typically I would be happy to wait for a community mod, but since the DAI engine isn't moddable we're reliant on BioWare to do it. In particular, it should be easier to flip between companion screens, we should be able to view the gold value of items in all screens, and we should have multiple sorting options. Enemy research items moved out of the Valuables category. To anywhere else. And, as a lower priority, it would be nice if there was an equivalent to the "face codes" of the Mass Effect series that people could use to share their own character designs. I suspect that, given the much higher number of facial features in DAI and the use of continuous morphs and color wheels instead of just slider slots, such codes might be prohibitively long; but anything to make it easier to share these rather than posting a gallery of slider positions would be really nice. Those of you who pre-ordered the game or sprang for the Deluxe Edition might be wondering where to get your stuff. Unlike DA2, they don't just dump it all in a chest for you to pick up near the beginning. Most of it is parceled out later on as you reach appropriate parts of the game. For example, after you learn how to ride mounts in the game, you'll gain access to various mounts like the Bog Unicorn that were previously added to your account. Weapons and armor are provided later in the game (I got them around level 11 but your mileage may vary based on how fast you're advancing). In many cases, there are multiple steps involved: you might need to complete a short mission on the War Table first, for example. The codex entries in this game are incredible. A lot of them are really funny; I'm a fan of Varric Tethras's "Hard in Hightown" series, but the "Randy Dowager Quarterly" might be even better. And anything with Sera's writing (either in the codex or War Table missions) is incredible. All of them are really well-written, though. I was particularly struck by the Saga pieces you discover while claiming regions in the Hinterlands. These are poems written in an Old English style, using alliteration rather than rhyming, and are superb. They perfectly capture the ancient, heroic feel of these people, as well as tell a compelling story about Avvar history. I've now recruited all possible followers. I like everyone, though some more than others. Sera, a potential love interest, has a permanent slot in my team; she cracks me up pretty much any time she opens her mouth. Although she seems to be an iconic archer, I decided to spec her as dual daggers. At the time, this was because Varric was a regular party member and it seemed redundant to have two ranged rogues. 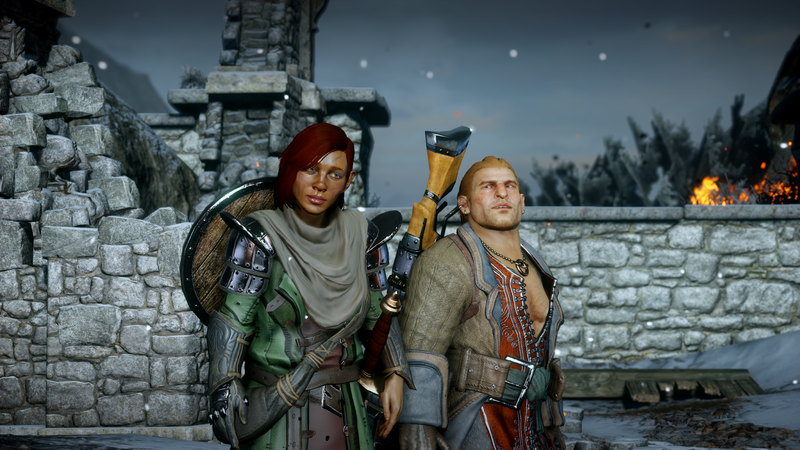 Since then, Varric has largely shuffled off the roster, and I've recruited Cole, who I then specced for archery so someone could use the bows I found. It works well in-game, though, and I enjoy fighting side by side with the foul-mouthed elf. 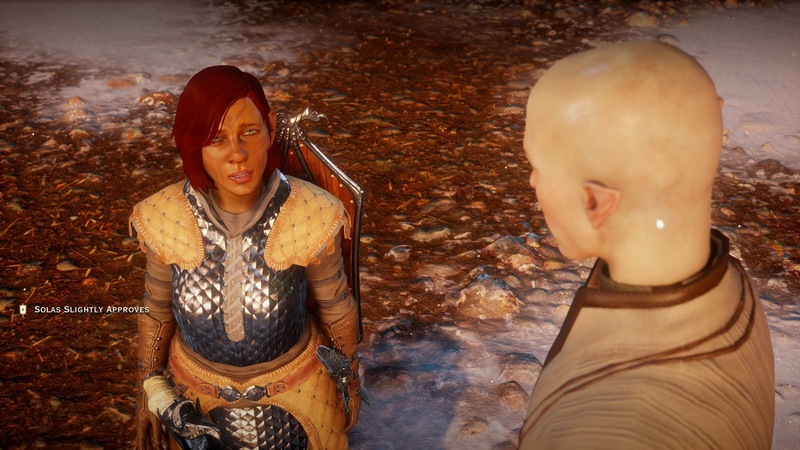 Solas is usually in my party as well. He's probably the most agreeable follower, and his role as a supporter is really helpful for the most challenging fights. I've had all three of my mages invest a few points in the Barrier skills, though, so I can swap in the others and do fine in most non-boss fights. Vivienne has mastered the Fire tree, while Dorian took Lightning. Each is now starting to explore their specialization tree, except Solas; for some reason the Rift Mage tree looks pretty weak to me, although I might not be appreciating something about it. 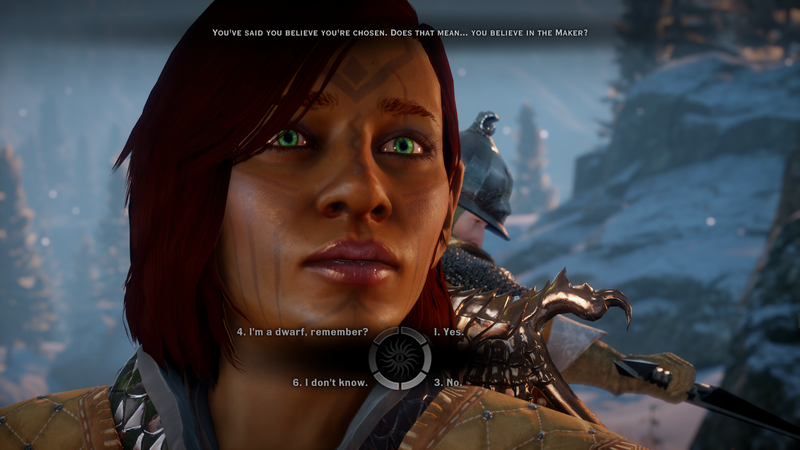 The third slot tends to rotate; if I have a personal quest active in the region, I'll usually drop in that character, otherwise it tends to be Vivienne, Dorian, Bull or Blackwall. Cassandra is a tank, which is redundant with my own play style. Varric is great, but my combat strategy generally focuses around getting all the enemies to cluster around Aztar and then unleashing AOE on them, which he isn't particularly well-suited for. Iron Bull and Blackwall were both specced as two-handed warriors; that does mean that Blackwall's specialization tree is kind of wasted, but at least for now he has some useful skills to develop. 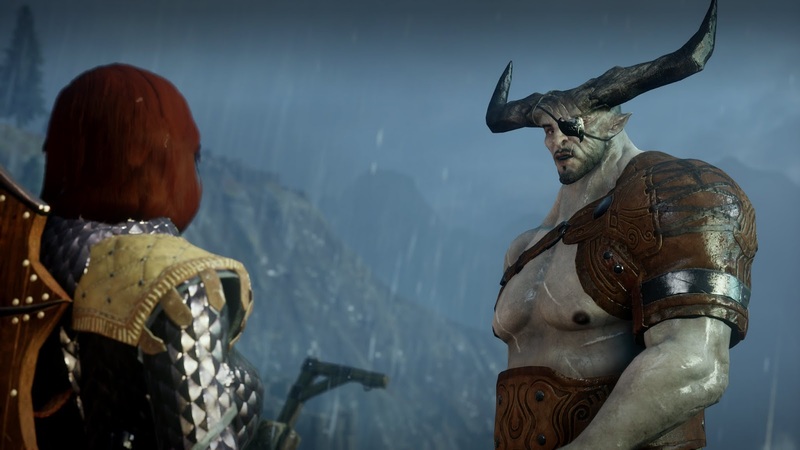 I suspect that by the endgame he will be completely replaced by Iron Bull, though. So: Like I mentioned up top, I had an experience this weekend that drastically catapulted my already-high opinion of Inquisition even higher. This was, of course, the sequence of events starting with your confrontation of Alexius and ending with you taking possession of Skyhold. It was... it was just so good! The sequence itself is incredibly dramatic, and I truly loved the epic fake-out, where it seems like Alexius is going to be the major villain of the game, only for you to defeat him and the entire plot shift on its axis. But that opening-up feeling you get when reaching Skyhold... I'm pretty sure that my jaw literally dropped there. A game that I'd already thought was huge was revealed to be orders of magnitude larger, with entirely new systems to discover and many, many more lands to explore. Not to mention that the plot was only now kicking into gear. Wow! Skyhold is incredible. I feel like this game would have almost been worth getting with just Skyhold and nothing else. I literally spent most of Sunday doing nothing but exploring Skyhold, consulting with my advisors, passing judgment, and directing Inquisition operations from the War Table. It's enormous, and populous, and is such a terrific unity of gameplay, story, and design. Throughout the whole game, I'd been enjoying all the small and large ways in which my choices in the Keep affected my game. Once I reached Skyhold, though, they got even better. I squealed with glee when I discovered that the "arcanist," who I had recruited from a war table mission to join my crafting operations in Inquisition HQ, was none other than Dagna! Dagna was a minor character in DAO, but an absolutely fantastic one who I vividly remembered the instant I saw her tile pop up in the Keep. She's just as great here, too, maybe even better. I love how she still has this fantastically perky, optimistic way about her, even after (or perhaps because) she has spent so many years traveling between the Circles and fulfilling her ambitions. I am really curious what would happen if your warden hadn't secured permission for her to join the Calenhad Circle, though. In one later piece of dialogue, she talks about how dwarves are the only race that can make enchantments, and mentions something like "I'm the only person in the world who can make runes like these. Well... I guess there is one other person." That leads me to believe that, if you didn't set up Dagna with the Circle, Sandal would be your arcanist. Which would also be awesome! Again, I love how your world state doesn't control whether you get a "good" or a "bad" future, but which of multiple awesome and fully-realized alternatives you can experience. The other wonderful thing I encountered was a lot of stuff to do with Serault. 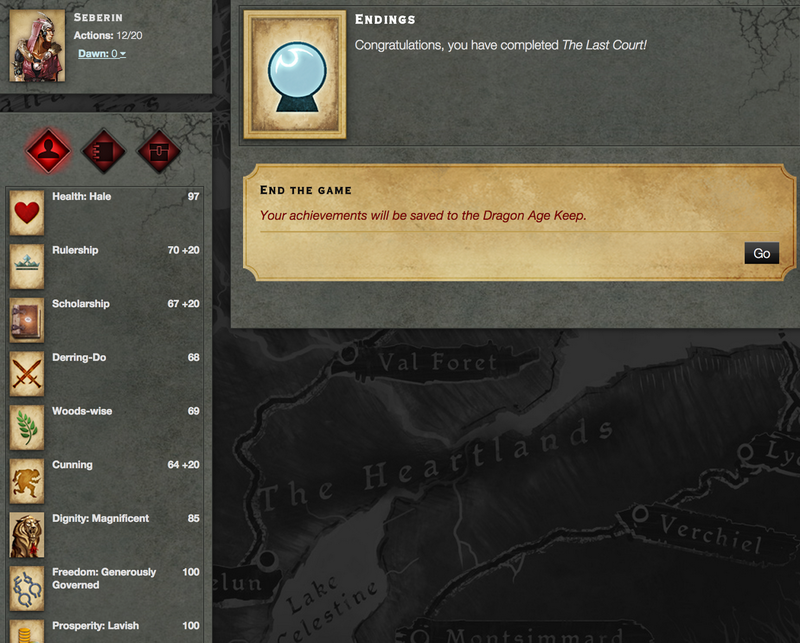 When I beat The Last Court, it noted that my victory had been saved in the Keep. 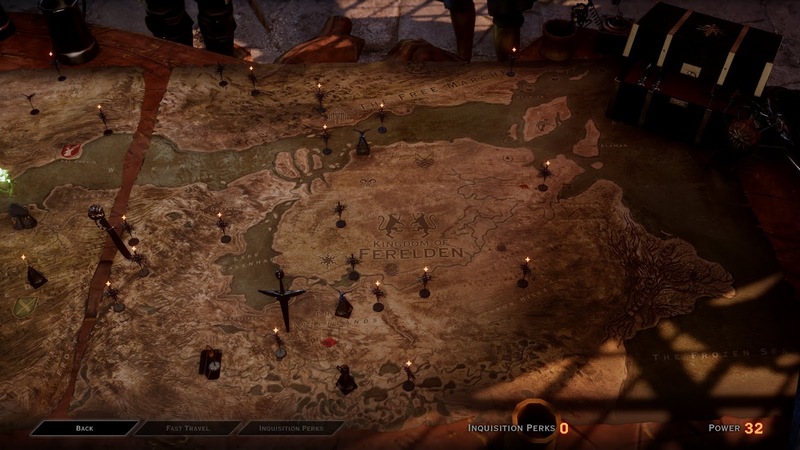 I'm not 100% sure exactly what impact this has had on the game; I noticed that there were several War Table missions related to Serault, the Shame and the Marquis, specifically mentioning Justinia's trip to the town en route to the conclave. After completing several of these war table missions, I ended up with a special option for windows in Skyhold, "Serault Glass." If that's a reward for beating TLC, that's pretty awesome! It doesn't have any gameplay benefit, so it doesn't feel like it's punishing players who don't feel like playing a browser game; but for those of us who did, we can get a cool little in-game acknowledgment of our accomplishment and a nice prestigious visual perk. Speaking of which, I'm having too much fun decorating my stronghold. In the early phase, I decided to go all-out "Dwarven Heritage", picking Dwarven banners and tapestries and such (but Serault glass, of course, because it is absolutely the best). I'm now shifting it to a more chantry-oriented look, burnishing my own living legend as the Herald of Andraste. Pro tip: shops in Val Royeaux will sell you beds and other nice living upgrades for your castle. The construction stuff is awesome, too. You "craft" castle upgrades the same way you craft potion upgrades or geological surveys. I haven't been able to make very many yet - need to find more quarries! - but I did manage to upgrade my garden. I had a choice between keeping it as a garden or making it a chantry; I felt aesthetically drawn to the former, but my character's plot arc decided for the latter. I had been worried that they might essentially pave over that beautiful garden and put up a stone structure, but instead the effect seems to have been erecting beautiful stone statues in the garden, which has a really nice aspect. According to the text, this should generate gold tithes for me, although I haven't yet seen if or how I can collect them. I'll hold off on plot discussion for later, but I did want to talk about one particular thing here: time magic. It was really cool from a story perspective, but I was surprised that it exists at all. It isn't one of the cardinal rules of magic, but given that teleportation isn't kosher, I'm a bit surprised that you can stop time, travel forwards in time and travel backwards in time. From a practical standpoint, it seems like this means that teleportation would be de-facto possible: stop time, then walk to Minrathous, then start time back up again. But, I'm definitely willing to give them the benefit of the doubt, for multiple reasons. First, it's still early in the game and more explanation may be forthcoming. Second, it's clearly a fringe and dangerous aspect of magic, not something widely used. Third, it's used for fantastic dramatic effect - the vision of the future is one of the most effectively deployed motivators I've seen in any recent game, significantly raising the stakes and providing a palpable sense of danger. Fourth and finally, it's their damn game and they can do whatever they want. So, yeah! I'm absolutely loving this! It probably says something weird about me that, when I need to take a break from Inquisition, I choose to spend that time thinking and writing about Inquisition. Also, uploading a ton of screenshots; view them here if you like! I have decided that, while I'll definitely keep on screenshotting, I'll refrain from doing so during cutscenes from now on. This is mostly because there's a stutter in my game whenever I do it; the video pauses for ~2 seconds, which then causes the audio to get out of sync. (It's possible that this might be related to the code that locks cutscenes to 30 FPS, which otherwise hasn't been an issue for me.) Perhaps more importantly, though, I kind of just want to absorb myself in the story as I'm experiencing it for the first time, instead of (just) going "Ooh, that gesture looks cool!" So: Plenty more photos coming of gorgeous landscapes, but fewer dramatic plot-related story beats. That's it for now! The more I play of the game, the more I feel like I've barely scratched the surface. 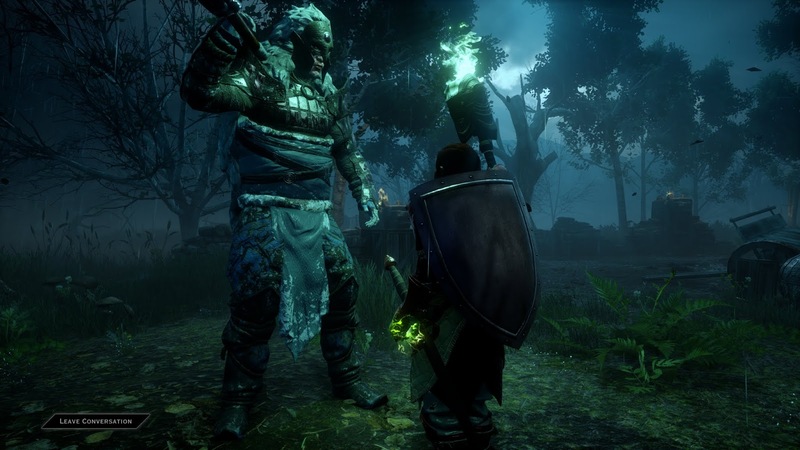 I'm following my standard RPG path of deferring the main plot line, but there's an abundance of non-plot-critical stuff to pursue, so I expect that I'll be enjoying the whorls and eddies in Inquisition for quite a while. I'll chime in here later if there's more that seems worth discussing; otherwise, see you at the end! 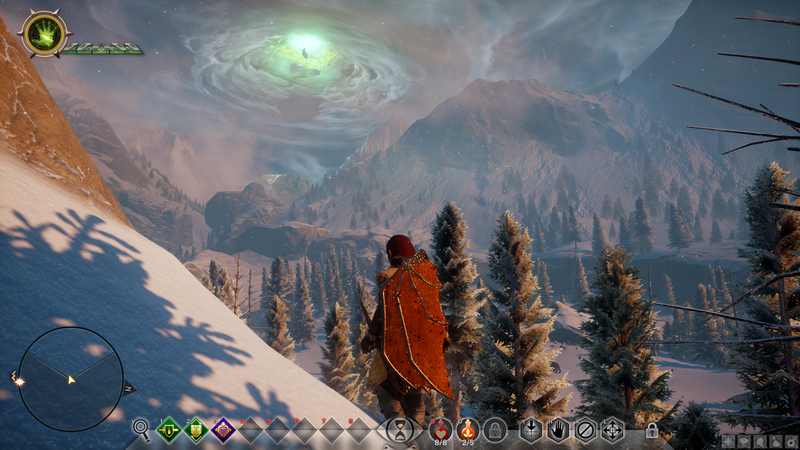 I’ve already started dipping my toes into the Dragon Age Multiplayer game (henceforth known as DAMP). It’s hard! And fun! I’ve written a bit previously about my experiences with Mass Effect 3’s cooperative multiplayer mode. I ended up being really surprised by just how much I enjoyed it. I hardly ever play multiplayer games, but that one really sucked me in: it was fun, fast-paced, and had a fantastic design that rewarded cooperation while still making it easy to just drop into without a dedicated team. My experiences with ME3MP actually spanned two distinct periods. I played a lot early on soon after ME3 dropped, motivated by the need to raise the Galactic Readiness rating in order to achieve the best endings in the singleplayer campaign. I stuck to the Bronze difficulty rating, and mostly ignored the weekend challenges which were aimed at more dedicated multiplayer folks. I took a long-ish break from MP while doing some other stuff, then got the itch and dove back into it several months later. I started paying more attention to strategy, looking up various builds and doing my own theorycrafting about how to optimally play. Before long I was regularly playing on Gold, eventually maxing out my rares and earning my coveted “Best of the Best” Shepard banner. Apart from my own improvements, though, I was also surprised to see gradual shifts in the community over this period of time. In the early days, the conventional wisdom held that the best way to play was for the team to gather in a defensible location (hopefully one with few entrances and a clear line of fire along approaches), and then hold it against the waves of enemies. We silently or loudly berated “heroes” who would venture off alone into the far reaches of the map, pursuing their individual glory at the risk of the team’s success. By the time I returned, though, the playstyle had evolved: instead of consistently defending a fixed location, the new teams had evolved into highly mobile kill squads: still staying fairly close together, but constantly moving around the map, killing off enemies as they approached. At first that struck me as foolhardy - “You guys are doing it wrong!” - but as I adapted to the new style, I came to understand the motivation behind it. When you defend a fixed position, enemies are always coming at you from all directions; in the later rounds, it’s easy to get overwhelmed if any of the entrances fail to hold, and then there’s no way to fall back without advancing through enemy fire. In the newer, faster style of play, though, players are constantly clearing sections of the maps of enemy threads. So, when you run into, say, a ravager or a praetorian, you can confidently retreat back to the previous area, knowing that it’s safe. I’m sure it also helped that by this point most active players had memorized the maps, and instantly knew how to efficiently move around the map while still being prepared for enemy ambushes. I’ve found myself thinking about that a lot while playing DAMP. At the moment, it feels insanely difficult. Even when playing on the easiest level, the matches are very punishing; I felt elated when I finally managed to win a game, after about a half-dozen party wipes. But, I need to remind myself, ME3MP also used to feel very difficult, back when we were underpowered and didn’t understand the strategy as well. I’m hopeful that DAMP will eventually evolve into a more forgiving experience. The most significant difference I’ve noticed so far in DAMP is that party coordination is much, much more important than in ME3MP. In ME3MP, you could randomly throw together a team of people, and it would work out. There were advantages to certain synergies, so if three players in a lobby were engineers the fourth player would probably swap out an adept for another engineer or an infiltrator. But in general it would just work out fine, particularly if the characters were sufficiently advanced or you were playing an easier difficulty. In contrast, DAMP is very deliberately built around the classic “holy trinity” of tank, healer, and DPS. (Minor qualification: there technically isn’t a healing spell in DAMP, but the Keeper plays the classical role of the healer through its Barrier spell.) When I was dropped into a game with four tanks, we wiped. Hard. I think DAMP’s structure is more fun and rewarding for pre-made groups, particularly if they plan beforehand and communicate during; however, so far it seems much less friendly to pick-up groups of random strangers dropping into a game. 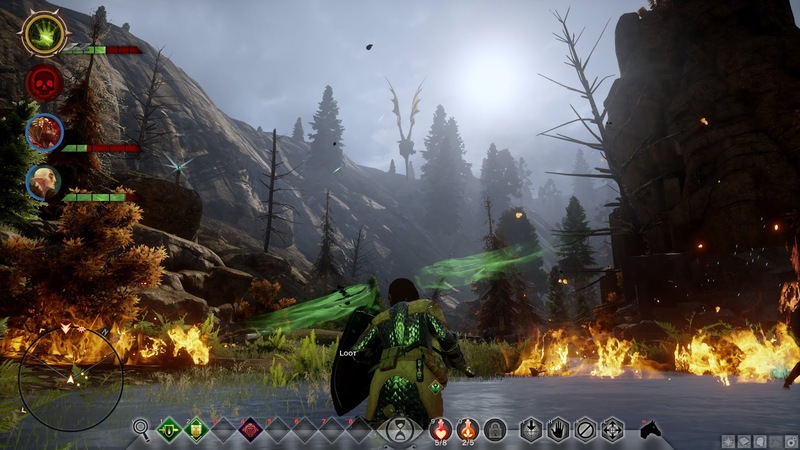 Besides the well-defined combat roles (which, I should point out, are wholly in keeping with Dragon Age’s well-established class types, much as Mass Effect’s combat synergy system was faithfully expressed in both single- and multi-player modes), the game further encourages you to travel with a balanced party via its design. Levels will contain special types of doors which can only be opened by an appropriate party member: locked doors by rogues, magical barriers by mages, and bricked-up entryways by warriors. If you don’t have the appropriate type of player in your party, you may miss out on some extra treasure or a shortcut through a level. That said, the one game that I have won so far had a party that, on paper, shouldn’t have worked. We started the match early from the lobby: me as a Legionnaire (dwarf warrior tank), and two others as Keepers (elf mage support “healer”). During the first map, a new character was added to our party, another Keeper. We did need to pass up some tempting locked doors; but the keepers were excellent, keeping up a defensive barrier on me while I drew the attention of most enemies, while also keeping each other protected and performing ranged attacks on our enemies. It was a really strong demonstration that teamwork is very important, and has an enormous impact on the outcome of a campaign. If you want to get items, buy the larger chests. If you want a mix of items and potions, buy the small chests; each individual item will cost 270 instead of 240 gold, but you’ll end up with twice as many potions. Use your health potions! This is the biggest mistake I’ve made so far, I always forget to use them. If you die three times (per game, not per level), you can’t be revived by your teammates. You get plenty of health potions from chests, there’s no reason not to use them. There’s a healing fountain at the end of each level. As soon as any player touches it, all players are instantly restored to full health and any dead players are returned to life. But, if your party is healthy, you should avoid touching it. This will “save” the fount for later, so if you get in trouble during the next map, you can run back and touch it. So far people are automatically tagging these things, but I’m pretty sure this will be one of the first pieces of wisdom to disseminate through the community. Pressing shift to sprint DOES work in multiplayer, even though it doesn’t in singleplayer. I tend to use it for most of the game: it helps to move through the open empty areas more quickly, and also works as a poor man’s gap closer in combat. While I always forget to use them, there are callout commands available on F1-F4 of your keyboard. (I think it’s D-Pad for consoles.) You can use these to highlight enemies that party members should attack, or to call for a retreat, etc. This is really nice for players who don’t have microphones or don’t want to use them. If you got the Deluxe version of the game, you’ll get an extra large chest at the start. There’s really no reason to hold on to a weaker version of any weapon or item after you’ve unlocked a stronger one, so don’t hesitate to salvage those. You can figure out what to do with the materials later. Crafting, upgrades, and runes all behave somewhat similarly to the singleplayer game. Unlike in singleplayer, upgrades can only be applied to a single weapon once and cannot be removed. There’s no push-to-talk support. That was really helpful in ME3MP, and I really miss it here. I hate it when anyone (including me) is constantly on throughout a match, but it’s also really nice to be able to chime in with a quick “good game” at the end or something. That’s it for now. We should be seeing the first weekend challenge popping up in the next few days, and I’m eager to see what it brings. I regretted missing out on so many challenges early in ME3MP’s lifespan, so I’ll almost certainly be making an effort this time around to at least accomplish those. And beyond that, I’ll probably keep diving into DAMP periodically. Much like ME3MP, I can tell that practicing my craft in multiplayer is turning me into a much better player in singleplayer, and I’d love to develop those skillsets sooner rather than later. This is a very accurate depiction of my recent mental state. I’ve been looking forward to this game for a LONG time. I’ve recently started wondering why I’m so excited about it. I’m sure that part of the reason is marketing; game companies have developed a very strong craft around how to build and manage hype leading into a release, and Inquisition’s campaigns is one of the smoothest and most effective I’ve seen. Still, you have to sell something people want to buy, and Inquisition is a very desirable property. I’m not sure what my favorite game of the past decade is, but I know what my top two are: Dragon Age Origins and Civilization IV. Everything else, even very good games, are a clear tier below that. Origins is a massive game, but is still so good that it’s one of the only games that I’ve actually played from start to finish more than once. It has really solid storytelling, with story beats that shocked me in my first game and still held up well on subsequent tellings. It has the best system of moral choices out of any video game I’ve played, with incredibly nuanced decision-making that produced many delightfully agonizing crossroads. And the game is endlessly variable: partly because of those branching and meaningful storylines, but also because of the deep tactical freedom the game gives you to choose between a wide variety of character builds and combat styles. To put it bluntly, I haven’t played any games in the past five years that have struck that kind of emotional spark in me. I wanted to feel that spark again, and Inquisition seemed like the likeliest candidate. 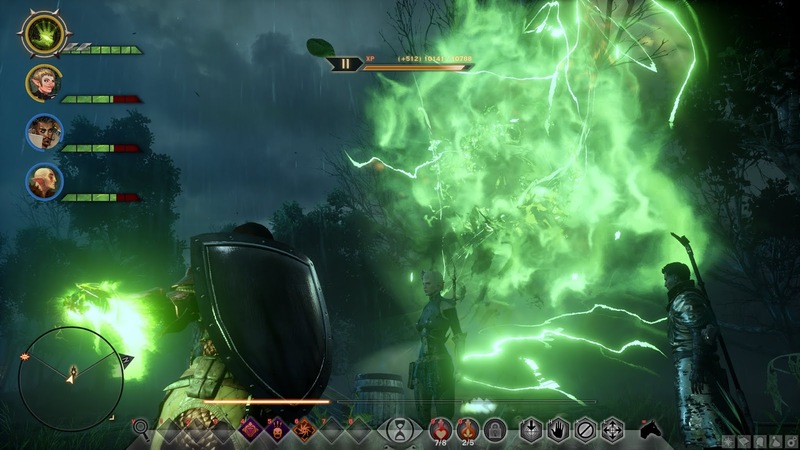 Early on, many fans assumed that Inquisition would return to the style of DA:O after the sometimes-reviled DA2. I was a bit surprised to learn that this was not the case: there were certain aspects of DA:O that they wanted to reclaim (customizing your companions, an epic storyline, wider choice of player character), but they also were focusing on some significant new additions to the franchise: a broader, more open world; a greater focus on exploration; and having the player act as the head of an organization and not merely be a gifted individual. It reminded me a bit of my surprise at the design changes they made for DA2: Origins was a massive, runaway success, so it seemed a bit odd that they apparently went, “Cool, people seem to really like this! Now let’s completely change the art style and how combat works!” Seeing this impulse at work in Inquisition, though, is actually reassuring: BioWare has never, in its history, been a company to churn out cookie-cutter sequels or rest on their laurels, either from a storytelling or a game-engine standpoint. I’m still way, way too early in the game to even begin doing a review, but I thought I would jot down a few early thoughts while they are still fresh. To begin, some technical notes! I jumped on the game the instant it unlocked, midnight on the East Coast. The servers were actually in really good shape, which pleased me and wasn’t too big of a surprise. XBox players with Early Access have been playing 6-hour demos for nearly a week, and players around the world were gradually jumping on as their timezones rolled around midnight, which certainly gave EA/BioWare plenty of time to evaluate demand, server load, and start spinning up new resources as needed. There were a couple of times during those early hours when I got the message that I had been signed out, but this was far less aggravating in Inquisition than it was in Origins. Origins was very heavily tied to DRM’d DLC, and games could get seriously screwed up if it was unable to verify your ownership of something. In Inquisition, though, there is no day-one DLC (hooray! ), and so no serious repercussions if you temporarily can’t connect to the server: it just means that your data isn’t getting sent at the moment, but it appears to still queue and will sync up later. The only thing that I really needed a network connection for was syncing with the Keep, which imported the world state I finished building a week or two ago. Already I’ve gotten a couple of nice little verbal nods in this game to my actions in previous games; more details in the spoilers, but it was great to see that it imported correctly! Good work, beta-tester me! As is usually the case for me in these games, I spent a good hour or so getting my character design right. Unfortunately, unlike in DA2 there’s no equivalent to the Mirror in the Black Emporium, so once you finish designing your character, you’re stuck with it for the rest of the game. On the plus side, the early part of the game shows you in a bunch of different lighting conditions, so I could quickly judge when my early attempts were hideous and hit the old reset button before I got too involved. Dang, the graphics look fantastic! I’m sure I’ll write more about that later after I’ve experienced even more of the game, but I’m really delighted with what I’ve seen so far. A lot of this is the sort of stuff you would expect - higher resolution textures, smoother animations, more detailed 3D models - but the art style as a whole is really strong and elevates everything even further. Most specifically, the faces in this game look incredible, in large part due to their lovingly detailed imperfections. Characters might carry small scars, faint moles, asymmetric freckles, all of the endearing qualities that we tend to latch onto in the real world but have been largely absent in our fantasy roleplaying games. It’s probably inevitable that anyone writing for long enough about Dragon Age will eventually write about The Elder Scrolls, so I might as well do that here. There has always been a pretty firm delineation between the two franchises. TES is about quantity; DA is about quality. TES is about open world; DA is about manicured environments. TES is about total freedom; DA is about emotionally resonant storytelling. Inquisition isn’t exactly stepping onto TES turf here; it isn’t truly a go-anywhere open-world game in the style of TES, Ultima or GTA. That said, it’s the closest it’s ever gotten to it. DA2 maps tended to feel like they ran on rails. DA:O maps didn’t have that same feeling, but that’s mostly because they were so huge: it would take a long time to explore a new map, but at any given point you would only have two choices about what direction to go in. Inquisitions’ maps combine the bespoke feel of DA:O maps with some of the freedom of TES maps. There’s no day/night cycle; but, that means you always get dramatic lighting that’s been carefully tuned to match the environment you’re in. You can’t talk to every person in the game; but, anyone you can talk with has something interesting to say. Maps feel far more wide-open than DA:O, or really any other BioWare game since driving the Mako in Mass Effect 1. More importantly, the areas are FUN - there’s usually a clear straightest path to reach your destination, but also tempting trails that offer alternate routes, and taking those other paths will let you stumble across fun, useful things. Perhaps partly motivated by this change in focus to exploration, the interface of the game has changed yet again from earlier installations. It felt a bit cumbersome at first, but I’m already getting used to it: I usually hold down the right mouse button more or less constantly while exploring, and move with WASD. A major, clever change in the game is a shift in how to discover lootable items. Going back 15 years all the way to Baldur’s Gate 2, BioWare games have generally done this (on PC) by holding town the Tab key, which highlights any available containers. I’ve generally appreciated this, and it sure beats playing hunt-the-pixel; but, from a purely physical standpoint, it isn’t particularly comfortable to keep Tab held down while I’m moving around. In Inquisition, they’ve replaced Tab with V, and also changed the way that it works. Instead of a toggle, it’s now an action, and instead of a straight-up highlight, it acts as a sonar ping. When you press V, a sight wave ripples out from your character’s position. If it bumps into any valuable items, you will hear a chime, and the object will illuminate for a few seconds. Now, the odds that the item is actually visible are not all that high: it may be behind you, to the side, or occluded behind a wall or tree or other object. But, that’s actually part of the fun: it’s kind of like you get to go on an easter egg hunt, and spend a few seconds looking for the valuable item nearby. It’s also been working great for exploration: while crossing big, open spaces, I can ping V periodically, and if I don’t hear anything, I know that I’m not missing anything important, rather than feeling the need to re-examine previously-crossed ground to make sure I didn’t overlook something important. While I’m generally really enjoying the game, I do have a few very minor niggles. We’ll see if any of these continue to bother me after I get more familiarity with it. Combat feels pretty awkward as a melee fighter. I think it would be fine as an archer or mage: you can press Tab to lock on to an opponent, and then hold down the left mouse button or R to attack. In melee, though, you don’t automatically follow locked-on enemies. So, you can “auto-attack”, but you’re just slashing empty air. I’ll probably get used to it, but as a melee fighter, it hasn’t felt great. Similarly, I’m having some trouble with positioning. I have the camera and movement down well in the exploration part of the game, but those same instincts tend to leave me exposed when fighting: I almost always end up with my back to opponents when I want to retreat while facing them. I think I’ll probably ultimately end up switching between different control styles, maybe doing WASD without the RMB during combat and with RMB outside of combat. I love the idea of tactical camera, but the controls are flipped there yet again. Fortunately it’s paused while in that view, so it’s not a huge deal, but it’ll be tough getting muscle memory for that when it’s inverted from non-tactical controls. Interacting with items is sometimes hard. 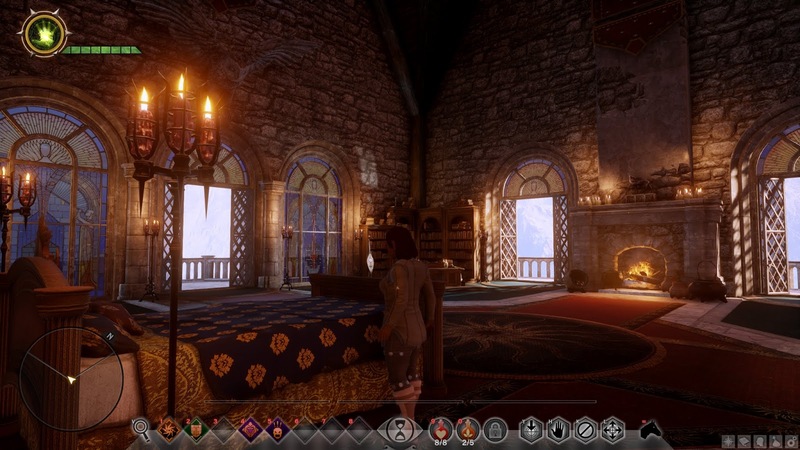 I’m very used to DA:O and DA2, when you could click on a chest on the other side of a room and walk over to open it. Now, you need to be practically on top of it. I’ve gotten more used to this in Inquisition even in my first few hours, in thanks due to all the practice with the new exploration system, and also by switching to pressing "F" to interact instead of trying to right-click. But, there was one really stressful fight where I needed to interact with an area elevated off the ground while in the middle of combat, and couldn’t figure out how to consistently do it. It required a lot of camera fiddling, moving, and re-trying, while attempting to avoid death. Not the most fun. I occasionally get into a weird state in conversations or other menus where my mouse doesn’t seem to be interacting with the screen: I can move my cursor around, but icons don’t light up and clicking does nothing. Fortunately, keyboard commands are still accepted, so I’ve never gotten stuck. At one point my mouse somehow started interacting with the windows under my game: whenever I would click, it would pause and minimize the game, and bring up something else. I ultimately ended up minimizing all other windows, then setting Inquisition to borderless windowed mode, then back to full-screen mode. That seemed to sort it out, hopefully it won’t come back again. In one particular scene, my character had a ridiculously ugly solid white layer on the bottom part of her upper lip. It was so bad that I figured something was wrong with the game engine, and quit and restarted, only to see that it was still there but went away after leaving that room. So far I haven’t seen that problem again. I have no idea if it was, like, a bizarre lighting quirk or what. So, yeah… there are a few warts, but again, nothing that really compares to the vast amount of fun to be had! You might recall that I was, um, unenthused about playing as Talion in Shadow of Mordor. I didn’t much care for his character, nor how little control we had over him. That experience made me even more excited than usual for a BioWare RPG, which is an experience strongly focused on players creating unique characters and then telling unique stories about them. I usually try to vary my characters from one game to the next: it would be boring if I only ever played as elven mages, for example. After the enforced humanity of DA2, I was salivating at the prospect of three races, let along the four we ended up getting. I ended up making a really radical decision: for the first time ever, in any BioWare RPG, I would be playing as a warrior! I’ve previously played as a male dwarven rogue, a female elven mage, and human rogues and mages, so I decided that this time around I would play as a female dwarf. It would have been more unique to go with a Qunari; but Qunari warrior seems a bit cliche. 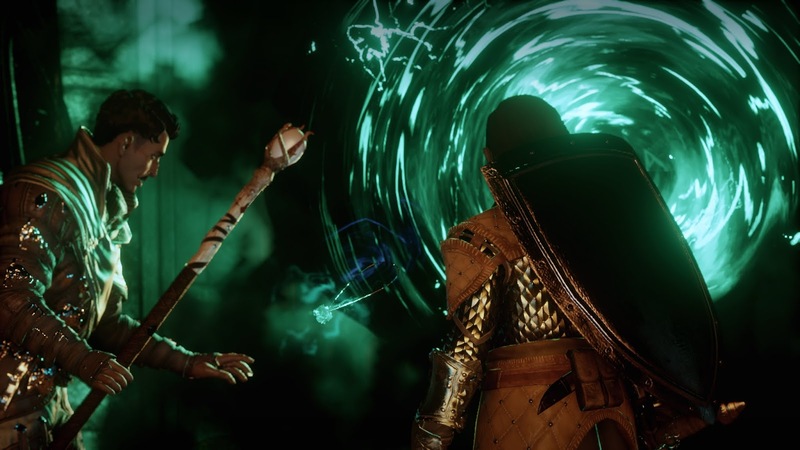 If I do a second playthrough of Inquisition, I’m very likely to try playing a Qunari Mage; the lore around Saarebas is pretty intense, and that would be a great story to explore. But, I typically save mage games for later playthroughs; magic abilities tend to be the most complex of the three class types, and I feel more confident tackling that if I have already gone through a game leveling my mage companions. Allow me to introduce you to Aztar Cadash! What’s probably gotten the most attention, though, is the makeup. Nearly all settings can be applied to both men and women: they share the same choices for hairstyles, Adam’s apples, etc. And, while men by default don’t wear makeup, both can select the colors and intensities they want to use for eye shadow, under-eye makeup, blush, and so on. There are some… pretty amazing results out there of creations people have come up with by going wild on these sliders. Anyways: in my first few attempts, I started off with a head shape similar to what I wanted, and then adjusted the coloring to get closer to what I had in mind. Once you get into the weeds, though, it’s hard to get things to match properly. Worse, any time I would pop open the makeup screen to play around with something, it would immediately shift from “decent” to “circus clown”. Unfortunately, there doesn’t seem to be an option in the character creator for “Oh, shoot, get rid of the stuff I did in this submenu and let’s try it again”: after you’ve made the selection, you can manually set something else, but can’t return to the default. Since I’m a guy, and have no idea what I’m doing, the odds of me correctly selecting something that would look OK were vanishingly small. 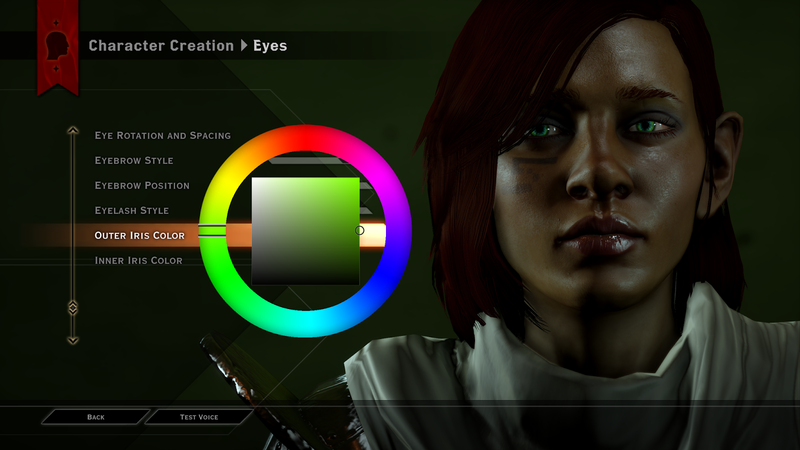 I ended up with something that didn’t look that bad in the character creator screen, but after I hit the bright sunlight I knew that I’d screwed up, with garish solid white blotches around her eyes. After the second mess-up, I decided to change tacks: instead I would start off with a color that looked good, then leave it the heck alone and focus on changing the geometry rather than vice versa. It all worked out! I was even able to get one of the better hairstyles without clipping through her ears, which I’d needed to abandon on an earlier attempt. So, yeah. It took a bit under an hour, but considering how long I’ll probably be spending with Aztar, I consider it time well spent. By now I’ve seen her in many different settings, and the model seems to be holding up well. I’m still getting to know her. According to her background, she was a surface dwarf who ran with the Carta, and was attending the Conclave when things went south. While you don’t play through a full origin story like we did in Origins, I’ve been really happy with how the game has subtly nodded to it several times. In an early conversation, Varric casually reveals that he has guessed my identity; I’m already feeling a stronger bond with him as a fellow surface-loving dwarf than I did with either of my Hawkes in DA2. Another Carta dwarf lingers outside the Chantry in Haven and casually chats with a nearby lay brother, explaining how the Carta is reacting to my newfound stature. And there’s even a repeatable quest available on my War Map that follows up on the orders I was given from the Carta before the game started. Inquisition has been great so far at these sort of subtle, world-deepening moments. Like I mentioned before, I haven’t seen a ton of stuff from the Keep appear yet; but I was chatting with the Haven quartermaster (quartermistress?) about her background, and learned that she was a Teryn Loghain loyalist. 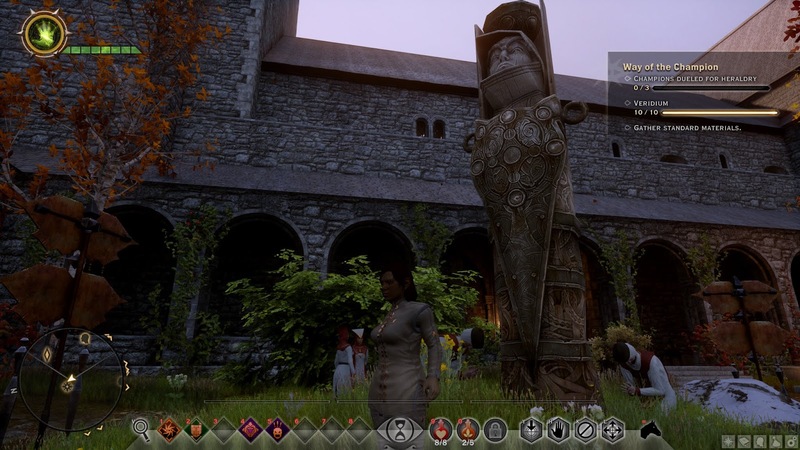 She sternly defends her erstwhile leader, explaining that she was at Ostagar, and knew that if Loghain hadn’t retreated when he did, the Darkspawn would have wiped everyone out. 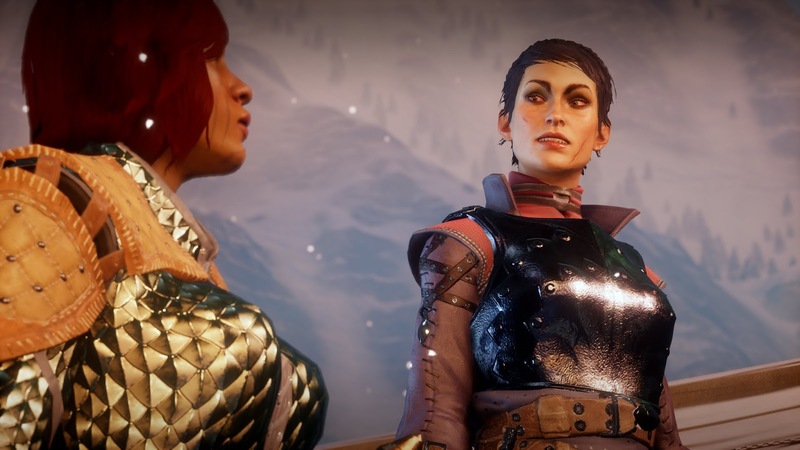 She got a bit teary explaining how Loghain was unjustly executed, and expresses gratitude that Queen Anora appreciated her loyalty and arranged for her transfer to Haven. Now: I haven’t played with any other world states, but I’m pretty sure that no matter what, that character still appears. But, the story she tells must be different depending on how events went down in your Origins story. Perhaps Loghain still lives; perhaps Alistair imprisoned Anora; perhaps the quartermaster fled Denerim out of fear for her life, or defected in a fit of rage. I love the storytelling style in display here: the frame is solid, but the fabric you stretch between it can contain any combination of colors, such that no two people will have exactly the same piece of art, even while they’re all playing recognizably similar stories. During that conversation, I had the opportunity to react to her defense of Loghain. For players who’ve played Origins, this is a very loaded conversation. 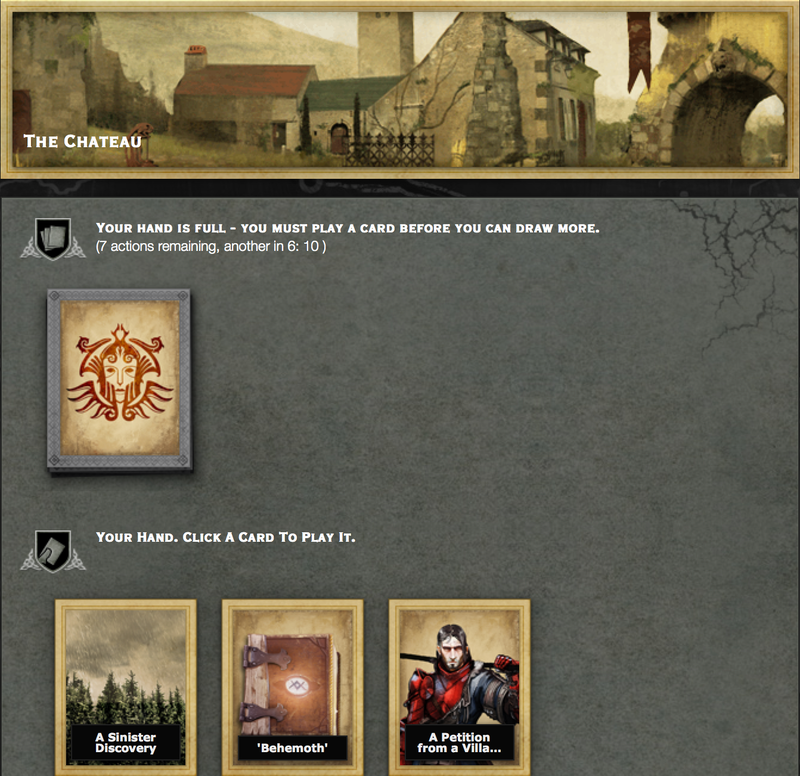 For players who’ve read The Stolen Throne, it’s even more loaded. That’s one of those moments where I need to stop and stare at the screen for a minute and gather my thoughts. Playing these games is a fascinating combination of passive and active entertainment, of hearing a story and telling a story. I often get swept up in the world and the story around me, thinking “That’s cool, that’s cool, and that’s cool!” And then everyone pauses, and turns to look at me, and asks, “What do you think?” And I go, “Uhhhhhhhhhhhhh……”. I like it! 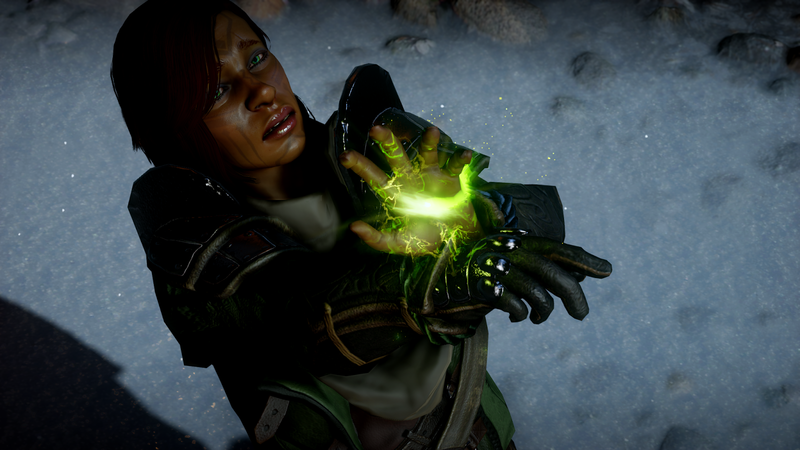 Moments like this force me to consider myself, consider my character, everything I know about the surrounding story and the deep lore of Dragon Age, and actually - gasp! - form an opinion. In this particular case: Kiriyon had certainly felt sympathy for Loghain, despite believing him to be a traitor; she would have preferred to imprison him, but Alistair took that decision away from her. However, Aztar has never met Kiriyon and doesn’t particularly care what she would think. In fact, all the political struggles of the kingdoms of men seem rather petty to a dwarf whose people have endured a millennium of ceaseless existential war against the darkspawn. It was probably around this point that I started developing the concept for my character. All of my previous DA characters have been good, but good in very different ways. Seberin was the most chaotic of the bunch, a kleptomaniac and a hedonist who shamelessly lied and cheated at any opportunity; but who had a deep connection to his family and, whenever the chips were down, would ultimately use his considerable skills to achieve the best outcome. If he happened to profit from that outcome, so much the better. Kiriyon was a quieter, more thoughtful and sympathetic soul. Her experiences as a doubly-disadvantaged minority (an elf and a mage) made her sensitive to the sufferings of oppressed peoples everywhere, and she selflessly would act to raise them up. Selene was turned from an early path headed towards thievery and devoted her energies to supporting her family and winning the approval of her new friends; unfortunately, those good-intentioned actions ended up bringing disaster down upon the people she most cared about. And Faria was a laughing, exuberant, life-loving force of nature, who loved tweaking authority and took no shame from her unconventional associations, and almost accidentally managed to save a city. While those four cover a wide spectrum of “good”, none of them were truly leaders. Seberin and Faria were determinedly independent. Kiriyon resisted enforcing her will upon others. Selene just wanted to live a good, quiet life. Aztar, I decided, would be different. She would have ambitions. Not megalomania, not machiavellian, but she would see the circumstances of the world, evaluate her own abilities, and calmly conclude that the best chance for survival would come from convincing everyone, one way or another, to follow her will. With that in mind, I knew exactly how to respond to the quartermaster. Selene would have been distraught by the betrayal of someone close to her; Seberin would have approved of her flexible moral calculus. To Aztar, though, loyalty is important. Loyalty means something. Loyalty should be encouraged and rewarded. I praised her loyalty, thereby establishing this value and, not coincidentally, positioning myself as someone who might deserve her own loyalty. An even more dramatic choice came soon after. Townsfolk had begun speaking of me as “The Herald of Andraste”. At one point, Cassandra asked me point-blank if I believed this. Loooooong pause there. For starters, dwarves don’t generally follow the Chantry. Secondly, even humans have difficulty believing in the active intervention of Andraste in Thedas. And yet… Kiriyon had helped establish a dwarven chantry in Orzammar, so the spread of faith there was not unknown. More significantly, the chantry is by far the most universal and most respected source of authority in all Thedas. Along with the Grey Wardens, they are the only organization capable of coercing international cooperation, and they legitimize rulership in most lands. I followed a train of thought to its logical conclusion. 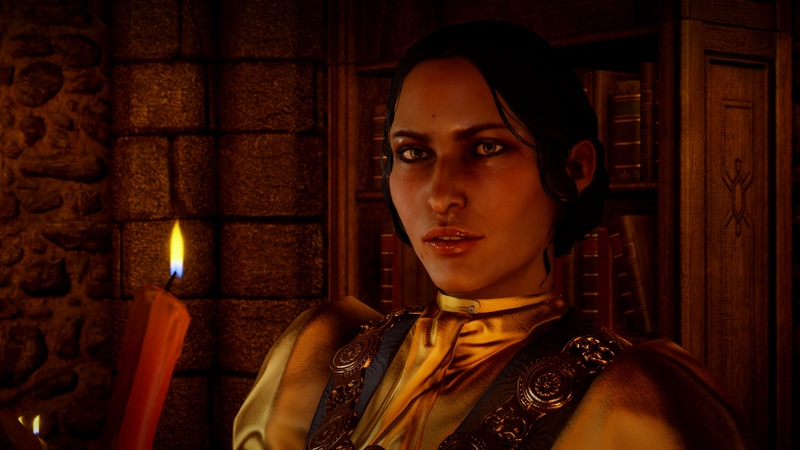 If I wanted to save Thedas, I had to lead it. If I wanted to lead it, I had to gain legitimacy. If I wanted legitimacy, I would need the support of the Chantry. If I wanted the support of the Chantry… well, I’d better believe in it, hadn’t I? In the game, this is just a single (albeit fraught) dialogue question. Like most great BioWare games, though, it prompted me to spin a whole layer of subtext and context to that decision. Aztar wasn’t being cynical, not exactly. She had been brought to this position by extraordinary circumstances, and was open to the possibility that, however improbable it may be, she might be who they claim. So, she seizes onto that kernel of possibility, and CHOOSES to believe: not because the evidence forces her to believe its truth, but because she wants it to be true. Anyways! Those are the sorts of things I’m thinking about while playing Inquisition. And when I'm not playing Inquisition. And when I'm riding BART or eating or trying to sleep. It... might be a bit of a problem, but at least it's a fun one to have! Huzzah! I’ve finished off a delightful romp through The Last Court. It was exactly what I was hoping for: an entertaining diversion that helped whet my appetite for Inquisition, which also shed light on some new aspects of Thedas and let me enjoy roleplaying as a different kind of character: a ruler rather than a killer. From what I can tell, that should actually lead nicely into the more expansive type of gameplay you will take on as the Inquisitor in the upcoming game, which makes me all the more eager to try it out. No major updates to my previous post about the mechanics of The Last Court. I will note that the Trophies, Viands, and Secrets will be needed in groups of 3, so if you’re negotiating with the Muttering Banker and trying to allocate your Bags of Royals, it’s good to focus on “topping off” to the nearest multiple of 3. In terms of getting the best outcome, your specific allocation of resources doesn’t really matter. You can get the best ending with, say, 50 Secrets or 50 Trophies. But, you’ll get some more lore and flavor by having a wider variety of resources. All things being equal, it will probably be the most fun if you try getting a mix of things, but don’t sweat it if you seem to be particularly Trophy-heavy or whatever. Speaking of which: in terms of strategy, hunting is BY FAR the most efficient way to gather resources. Doing court stuff in the Chateau is a lot more fun, but it's an extremely slow and expensive way to acquire end-game resources. Once your stats get to a certain level, though, you can complete a hunt in just 4-5 actions with no penalties, so that’s a much quicker way to get the resources you need to win the game. If and when I play this again with a new character, I will probably do “court stuff” for the first few days until I get enough favors for the set of advisors I want, and then mostly focus on hunting, just returning to court for Market Day and to break up any monotony. Some details about my game: I resisted the temptation to break into the Chantry. I love that the choice was there, but the whole Mr. Eaten experience has taught me to be extremely cautious when the game warns me not to do something. I didn’t seem to get any particular reward from refraining, but I’m pretty sure that, if I had broken in, it would have complicated the Divine’s plans to re-consecrate it. I thought that the Horned Lord stuff was done extremely well. I was similarly cautious about all of my dealings with him: I avoided antagonizing him, but also took care to not become indebted to him. This led to some tense situations, most notably the Bard’s rescue. I paid tribute to the Lord, but once it became clear that he would also demand a favor, I decided to rescue him myself. I debated whether to attend the Feast or not, and eventually came to the conclusion that it would be more insulting to snub him. I was cautious during the Feast, and at the end, decided to return the favor… then groaned in happy frustration when I realized how he had tricked me. Well played. It led to a tense moment during the Divine’s visit, but I was able to fob him off and everything ended well. In terms of my personal relations: there are a lot more Counsellors than other types of advisors, so the choices there were a bit harder to navigate. 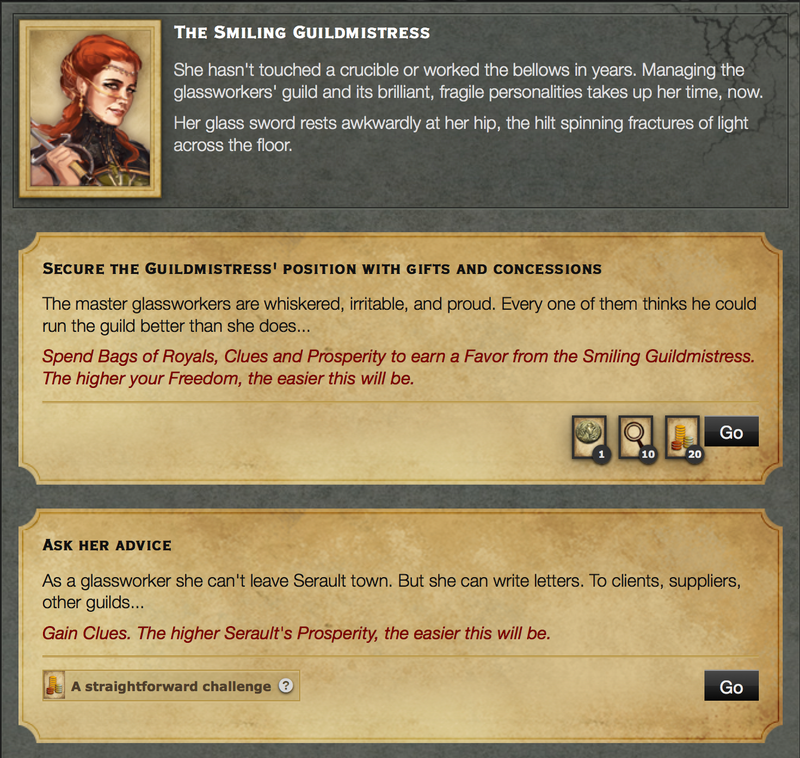 I ended up deciding to go with the Smiling Guildmistress as counsellor. The Dashing Outlaw is an intriguing figure, because she’s one of the few advisors who can fill multiple slots, either Accomplice or Bodyguard. I decided to take her on as my Bodyguard; in retrospect, though, I think she’s more expensive than most other choices (which does fit the flavor and her flexibility nicely), so I might not do that in future play-throughs. Finally, I was fascinated by the Well-read Pig Farmer, and took her on as my secret Accomplice. 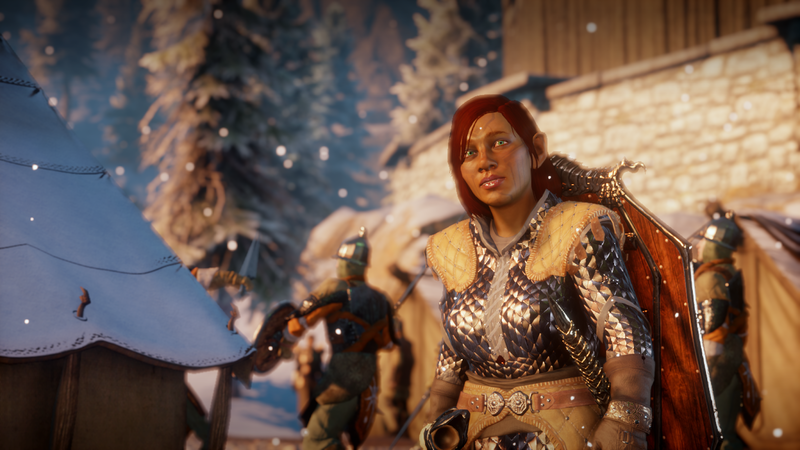 I've been curious about Tevinter ever since Origins, and while we don’t learn a ton from her, she was a great, stereotype-busting person to interact with. 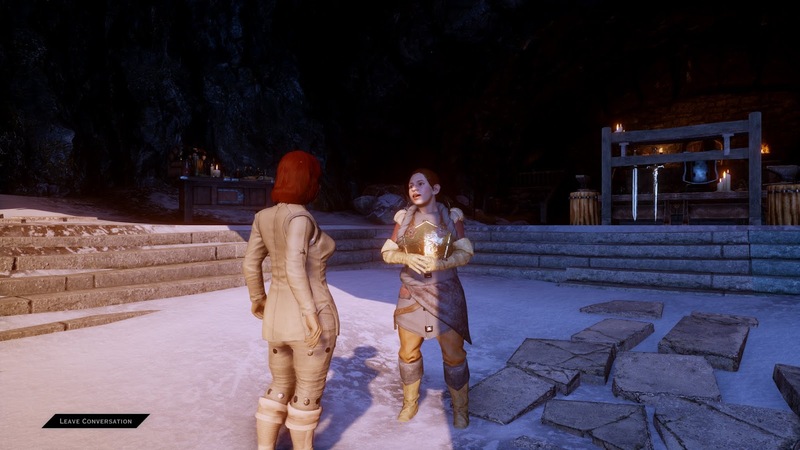 This wouldn’t be a BioWare game if we couldn’t complain about romances, so I’ll add a quick note here. I was a bit bummed that there are only two options, the Bard and the Abbess, neither of whom were super-interesting to me. What’s more annoying, as far as I can tell, you can only take the Abbess as your lover after she becomes your Counsellor. Since I didn’t realize that until after I had recruited the Guildmistress to that slot, I would need to have gotten rid of the Guildmistress, then recruit the Abbess to Counsellor, then presumably get more Favors and take her as Lover, and THEN RE-RECRUITED the Guildmistress. I guess I’ll keep that in mind in case I play again, but it felt a bit frustrating mechanically. I was also disappointed that you can’t romance the Smiling Guildmistress or the Well-read Pig Farmer, both of whom appeared to be both intriguing and available. The most fun parts of the game were ongoing stories related to Market Day. There tended to be some really good choices and roleplaying opportunities in here, like deciding how to deal with the Elusive Iconoclast; as a fairly egalitarian-minded ruler, I used a soft touch and put her into a peaceful retreat. My favorite of these plots was probably the bit with His Dour Lordship, mostly because it spins up multiple sub-plots which aren’t immediately obviously connected with the main one. I’d acquired several Favors from him, but never really trusted him and so never made him my Counsellor; after determining that he was the spider at the center of the web, I gladly broke protocol and imprisoned him in my dungeon. Hey, what’s the point in having a dungeon if you can’t use it? The actual Feast of the Divine is the obvious climax of the game, and I found it very satisfying. There are a couple of complications to manage, but for the most part you’re reaping the benefits of all your hard work over the previous seven days. She’s a cool character; I love the brief glimpses we’ve gotten of her in Leliana’s Song and The Masked Empire, and Chris did a great job at capturing her voice during her dialogue here. I actually debated for quite a while whether or not to blackmail her; I had plenty of Secrets, but it felt like a very aggressive thing to do. I ultimately went ahead with it, and the resulting exposition was well worth it. I won, of course: redeemed the Shame, got back my sweet glass antler mask, and am left happily ruling over a wealthy, proud, and independent land. All hail Serault! All hail the Huntress! So, yeah... obviously, I enjoyed The Last Court a lot! It looks like the fanbase has gotten into it, too. There's even some fan art starting to spring up! 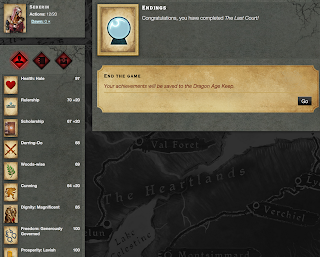 According to the end of the game, the results have been recorded in the Keep. That’s pretty cool! There’s no UI for it yet, but I imagine it’s coming. It’s exciting for multiple reasons, one major one being that I think this is the first time that the Keep will be recording “live” outcomes as we play them, rather than allowing us to manually specify outcomes on our own. Based on what I’ve read on the forums, it sounds like the ending of The Last Court won’t have any impact on Inquisition. Still, it’s a fun game in its own right, and I wouldn’t be shocked if it comes into play at some point in the future. 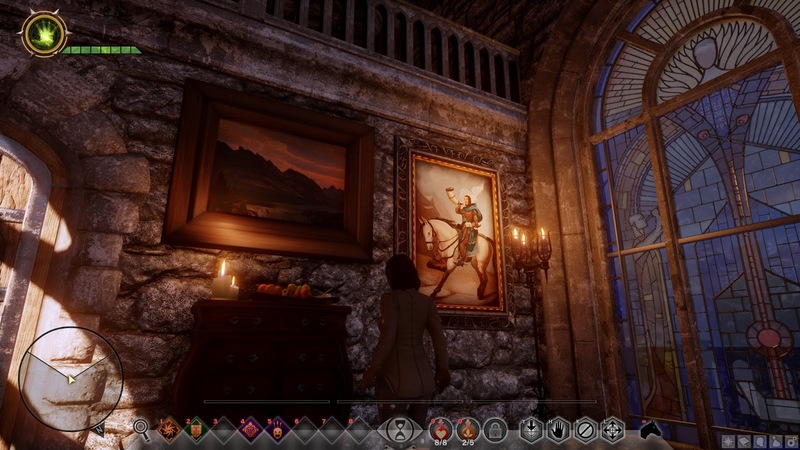 One of the great things about the Keep is that it can become a sort of clearinghouse for all Dragon Age-related activities: not just the main games, but little standalone things as well, such as bits of interactive fiction, or even offline things like the pen-and-paper roleplaying game. 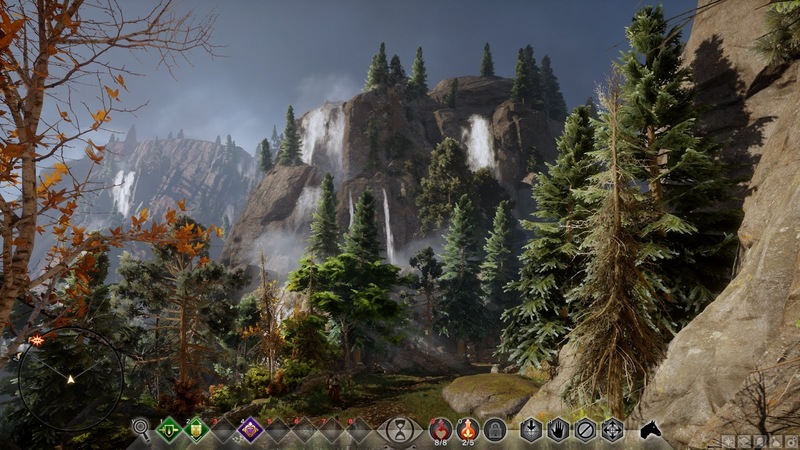 It will become increasingly challenging for the Dragon Age team to keep world states coherent as more and more variables come into play; but, as the Keep team has made clear, the goal is not just to support the traditional branching-plot purpose, but also to sort of serve as a place of record. The Keep is a sort of living history: a statement of what we have accomplished, of what has happened, and what COULD have happened. In that sense, it’s very much in keeping with the delightfully ambiguous sense of history that was showcased in The World of Thedas, which in turn is much like our own world’s treatment of history: often disputed, often challenged, often unknown, the more so the further back one goes. The tale of Serault feels very important at the moment. Before long, it will become another tile on the grand mosaic that depicts my own personal conception of Thedas. There's a particular type of weird feeling that I think most of us have experienced at least once. Imagine you're going out to lunch with an old pal from school. A friend from work comes into the restaurant and heads towards you. You're about to introduce the two of them, but they greet one another and act like old friends. A little part of your brain explodes: "How do you two know each other?! You belong in separate universes!" It's a disorienting feeling, but also a really pleasant one, to realize that awesome folks know each other and do stuff together. That was pretty much exactly the feeling I had upon hearing the announcement about The Last Court, the heretofore-secretive collaboration between BioWare and Failbetter Games. I've loved BioWare's games since the original Baldur's Gate, have thoroughly immersed myself in the world of Fallen London, and more recently been actively helping to beta-test Below, Chris Gardiner's story-rich roguelike StoryNexus game. When I heard the details of the project - it's a StoryNexus-based game written by Chris Gardiner set in Orlais during the time leading up to the start of Inquisition - I instantly started salivating. The fact it's integrated with the Keep makes it all the better. Based on the chatter I've seen in online forums, it looks like there's a very respectable crossover of fanbases between BioWare and Failbetter. That shouldn't be surprising. I'm pretty sure that BioWare is the most narrative-driven AAA game developer, and Failbetter has a similarly intense focus on narrative from an indie background (albeit focused on slightly different genres). The early reaction seems to be very positive. 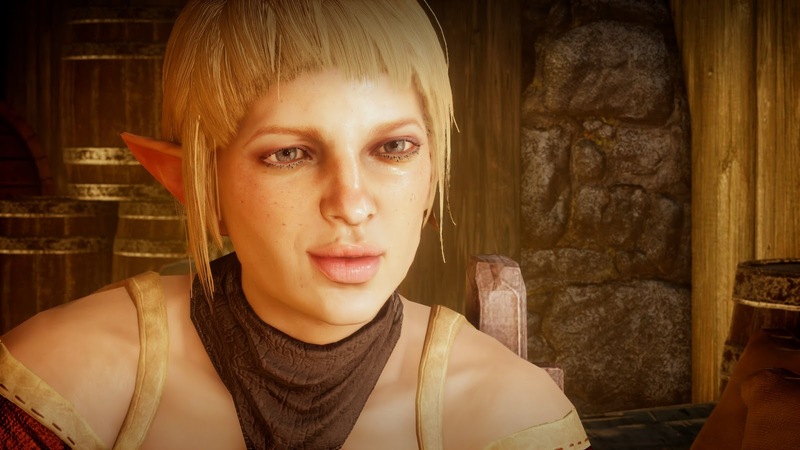 Frankly, we're all starving for some Dragon Age, and The Last Court is doing a fantastic job of providing a peek into another part of Thedas, some tantalizing lore about old and new characters, and also giving us a chance to play as a different type of character, actually making political decisions that shape the nature of your realm (something that previously was only briefly touched upon in Dragon Age: Awakening). For those of you who haven't played StoryNexus games before, you're in for a treat! They're vaguely reminiscent of a Choose-Your-Own-Adventure story, but much more game-like. You have various stats and items, and can often choose which of several storylines to pursue at any given time. Each "storylet" is a bite-sized standalone narrative chunk that lets you make a decision and experience the results, which might also tie into a larger overarching plot. So, it's the sort of thing that's perfectly flexible based on your available playtime: you can squeeze in a couple of storylets while standing in line at the grocery, or sit down at your computer at the end of the day and play for a longer stretch. The mechanics of the game bear some similarities to free-to-play games... wait, come back! There are microtransactions in here, but they're absolutely not necessary to play or enjoy; no content is gated behind a paywall, and paying is just for the impatient. The Last Court uses a virtual currency called "Dawn" (unlike the "Nex" in other StoryNexus games) which you can use to play more frequently; I haven't bought any (sorry, guys!) and am pretty sure that I won't. But, again, I don't need to - I'm enjoying the savoring of this game, so I wouldn't want to rush through it anyways. One aspect that's very different about TLC compared to other Failbetter games is the addition of a real-life time factor. Every 24 hours, another "Market Day" occurs, which spins up another aspect of the story and provides in-game rewards. There's a limit, though: you only have seven Market Days to prepare for a major event that ends the game. This means that I can't pursue my standard strategy of solely focusing on grinding up stats in the early phase of a game to overcome the challenges later on: sure, you can improve stats, but you can't just do that, you also need to start work sooner rather than later on accomplishing your goals. I appreciate that, and I also appreciate how it puts a de-facto time limit on this game. Free-to-play games often get the bad rap that they never end and only exist to string you along on a treadmill. There's no treadmill here, just a path, and once you reach the end of that path your journey is over. I still haven't beaten it yet, but I think I've gotten a pretty good handle on the mechanics. Here's what I've gleaned so far, a mixture of observation, second-hand reports, and deductions. I'll try and update this post as I get further along. No plot spoilers here. Your character's primary stats are Rulership, Scholarship, Derring-do, Woods-wise, and Cunning. These can only increase, although raising them is usually slow or expensive. Raising them will increase the odds of success for many choices you can pick on cards. Serault's stats are Dignity, Freedom, and Prosperity. These can go both up and down. You'll often deliberately "spend" some of these stats in order to increase some other stats or gain items. It's generally better to keep these high, although in some certain circumstances lower is better. If one of Serault's stats falls to 0, you'll draw a new un-removable card that effectively lowers the choices in your hand from 3 to 2. If two of the stats fall to 0, I think you lose the game (haven't tried yet). Your "menaces" are Peril, Twilight, and Rumors of Revolution. You'll generally want to keep these as low as possible. When they rise too high, certain choices grow more difficult and you'll start seeing harder/worse options on cards. At 75, you'll start drawing negative cards related to this menace. At 100, you'll unlock very risky but profitable choices. Clues are a very common resource. They can be used to start hunting quests, to increase stats, and sometimes to gain favors. Bags of Royals and Authority are less common. They can sometimes be traded for other resources, favors, or to get easier options on certain cards. The ultimate goal of the game is to accumulate a large total number of Secrets, Viands and Trophies. You can earn these by completing Hunting quests or spending other resources. You will rarely use these. Your primary stats will rise a fraction of a point when you succeed or fail at a challenge ("Rulership is increasing."). It takes many actions to raise a stat this way. If you accumulate Clues, you can gain 3 points in a stat by spending your current stat's value in clues on a corresponding card. For example, if you have 20 Cunning, you can pay the Outlaw 20 Clues to go up to 23 Cunning. You can also spend Clues to increase Serault's stats or lower Menaces in the same manner, although this seems like a waste, since there are far easier and cheaper options to improve these. The options on some cards played from your hand can be random. (These are often, but not always, accompanied by the icon "The Way of Things.") If you don't like the options on a card, you can try playing another one first, which can change the available choices. And, if you don't like any of the branches on a card, you can click "Perhaps Not" to back out. It's sometimes better to do this than to fail at a challenge. It seems like there are many options to recruit Counsellors, and far fewer for Bodyguards and Accomplices. Since Favors are expensive, you'll probably want to plan ahead of time which one(s) to pursue and go after them. Once a day, you'll draw a "Market Day" card that gives you a significant advantage and/or kick off a new storyline. There's a limit to certain stats: 100 for Serault's stats, 5 for Authority, and 3 for Favors from any particular person. If you're already at the cap, trying to exceed it will be a waste. By the last day, you'll want a total of 50 items. It sounds like all three types are valid, but getting a mixture may give you more flexibility (haven't verified this yet). Trophies are very easy to collect by Hunting with a decent Woods-wise skill. Pursue the Boar and take the Hounds. Viands can also be collected by Hunting a Stag, although this is a little more challenging. Secrets are best collected by doing the Market Day pinned cards. All three types of resources can be collected by trading Favors with certain recruited advisors; or by raising one of Serault's stats to 100 and then spending 50 points in that and 25 Clues; or by spending Bags of Royals. These are the most expensive methods. Have fun! I'll probably make another post about the plot after I've finished the game and can speak to the story. I will say that so far I'm having a blast. This is a true peanut-butter-in-my-chocolate situation, and I'm loving the offspring of these two wonderful developers. In case you couldn’t already tell, I’ve been on a huge video game kick lately, which is amping up with Civilization Beyond Earth. Civ has been one of my favorite series ever since the beginning; in fact, it’s by far the longest-running franchise that I follow. It’s been a series of ups and downs with me; I loved I, II, and IV; enjoyed Colonization; liked the concept of Alpha Centauri while not finding it very fun; and haven’t particularly enjoyed III or V. That’s still a pretty excellent overall record, though, and in the absence of any particularly frightening information I tend to look forward to a new Civ game with a lot of anticipation. 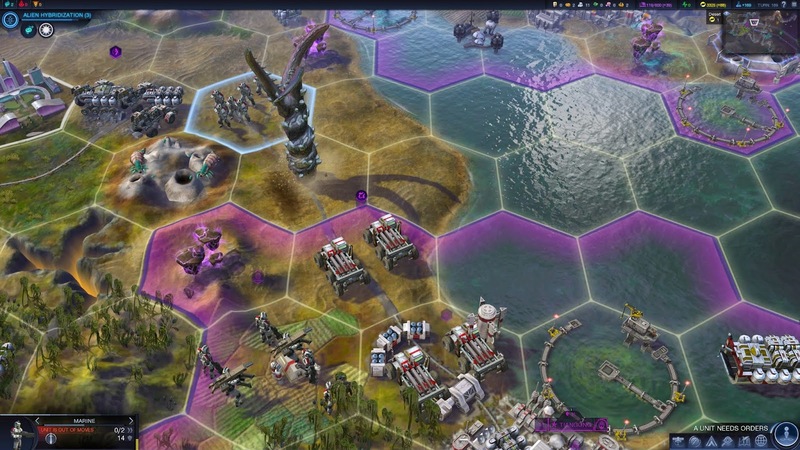 Beyond Earth has been acquiring much more attention than usual. Alpha Centauri wasn’t a particularly successful game, but it had some of the most incredibly devoted, die-hard fans anywhere, and there’s been intense lobbying for well over a decade to make a sequel. The path for this was always going to be difficult; Alpha Centauri was made during the MicroProse years, and unlike the Civilization rights, Sid Meier didn’t get to reclaim Alpha Centauri when he left to found Firaxis. 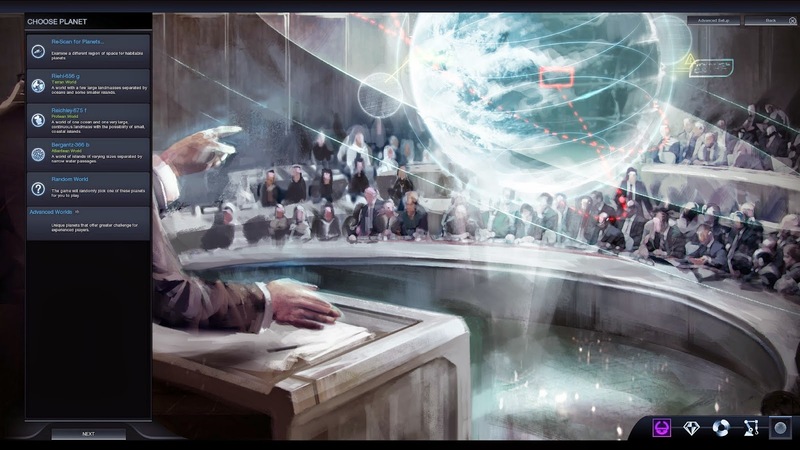 Still, the general idea of “civ in space!” is a very compelling one, and it isn’t at all surprising that they would return to this in one form or another. Beyond Earth ends up being a really unique game. 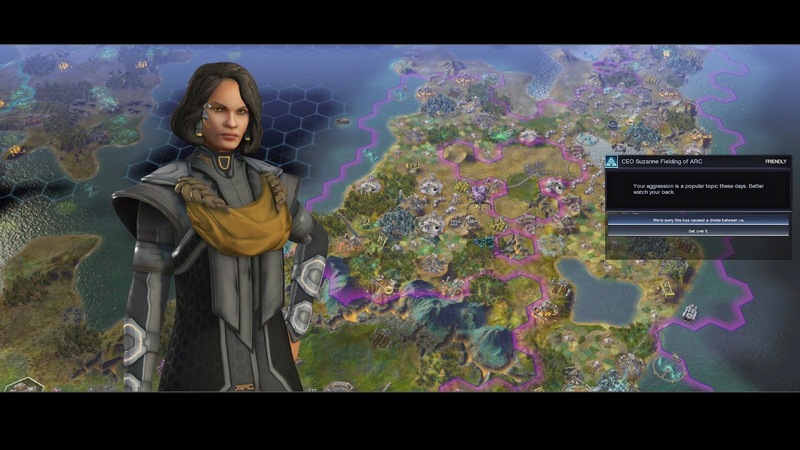 It isn’t a retread of Alpha Centauri, nor is it a reskin of Civ V. While it’s obviously built on the Civ V engine, it massively overhauls all of its systems, creating a game that is approachable but ends up feeling quite different. One thing it shares in common with AC is a surprisingly strong narrative for a turn-based strategy game. Neither game obviously starts off telling a story, but as the game continues you’ll encounter more and more events that provide narrative hooks, linking in your strategic struggles to a deeper, more thematic plot. Of course, the biggest story is the one you create for yourself, the story of your triumphs and struggles and the rivals you face and vanquish in your drive towards victory. The game starts on a really strong note, with a surprisingly effective opening movie that establishes the background fiction for the game. Due to the Big Mistakes on Earth, humanity is desperate to escape the ruined planet and start anew elsewhere. This could be communicated via apocalyptic mushroom clouds or mass riots or other standard signifiers; instead, the movie goes small, zeroing in on a father and his daughter. There’s no dialogue, but their expressions of dismay and hope convey everything we need to know. I really liked this, for a couple of reasons. First of all, it really grounds the action in a great way, reminding us that this is ultimately a story about people: we are responsible for the survival of humanity, not in an abstract sense but in the specific sense of needing to keep this individual people alive. Ultimately, though, that opening sequence will resonate extremely differently depending on which affinity you pursue throughout the game. In my game, I’ve been pursuing Harmony, where we shed off our corrupt, weak Earth selves and unite with the benevolent alien life we have encountered. In this context, the opening shows the folly of our old way of life, and how lucky we are to have chosen a more peaceful path. In contrast, a player who pursues Purity will read that opening scene as the moment when humanity was knocked down, and the rest of the game as humanity getting back off, dusting itself off, and diving back into the ring. Here, you are telling a tale of triumph, where we hold on to our essence even when orbiting a distant star, and can admire our strength and resilience even in the most desperate of circumstances. Finally, a Supremacy player would probably be startled to realize that, by the end of the game, they’re no longer the same people as they were at the beginning. That father and that daughter are no longer part of the same species. A supremacy player on the cusp of victory might re-watch that clip and feel much the same way we would when watching tadpoles: interesting in an academic sense, but not something we can truly relate to. There’s a ton of reviews out there that summarize the new features in CBE, so instead I’ll just babble for a bit about my first game. In contrast with earlier Civ games, which just had you select a civilization and, possibly, a leader, you have a whole bunch of options to pick from at the start of CBE. In fact, this will prove to be a major theme throughout the entire game: surprisingly frequent and significant choices. These are rarely narratively satisfying, but can have huge impacts on the mechanics of your play, as you can adapt common elements available to every player to have vastly different effects. Anyways: your opening choices have to do with things like the expedition sponsor, the colonists you select, the materials you take, etc. All of these are independent of one another, giving you a lot of freedom in fine-tuning your desired stats and gameplay. As with earlier Civs, human players will have the best success if they plot a strategy early in the game and doggedly pursue it. So, here, you can usually set yourself up pretty well at the start of the game; after making planetfall, you can explore your immediate surroundings, locate your neighbors, and make some final decisions about what kind of game you want to play. In my case, I opted for the Pan-Asian Cooperative, whose bonuses to wonder construction and worker speed are really helpful for builder civs; I took along aristocrats, who provide bonus energy and health; a fusion reactor, for a starting bonus of 100 energy (= money); and machinery, which gave me a free worker at planetfall. I’m very happy with how all of these turned out; I’m sure other combinations are fine, but I didn’t have any problems at all with this one. Ever since Civ III, I’ve been drawn to builder civs, so I had decided from the beginning to try and pursue as pacifist a path as possible. This would also have the effect of allowing me to simplify my game somewhat and focus on mastering a subset of the mechanics in this game; I ended up paying minimal attention to combat, and almost entirely ignoring the orbital layer, while investing heavily in infrastructure, virtues, trade, and espionage. Similarly, I decided early on to try and pursue Harmony, reasoning that this would allow me to remain on friendly terms with the aliens and minimize my warmongering. That turned out to be not entirely true. Your choice of affinity is pretty orthoganal to your position on the hostile/pacifist scale. Furthermore, most of the later techs that grant Harmony points are pure-military techs for creating new bug units, which put me in the weird position of choosing between violent harmonic tech and peaceful unharmonious tech. I lucked out, starting off on the eastern shore of a long and fairly narrow continent. I eventually ended up with Polystralia a decent distance to my west, in the center of the continent, while the Kavithan Protectorate were wedged in the far west. All of the other civs shared a large and pretty chaotic continent on the other side of a wide ocean. My capital wasn’t very resource-rich, but I was able to claim some really good strategic resources and upgraded tiles for my later planned cities. Most of them were coastal, although I did place one inland to maximize available sources of titanium. Trade is really fantastic in this game. It’s kind of a hybrid between the active and the passive trade systems that have been alternately deployed in earlier versions of Civ. You build specific trade units, and must choose their destination; you aren’t responsible for actively moving them around, but you’ll see them on the map, and you’ll need to protect the units if you want to keep your trade routes productive. It ends up feeling a bit like a public/private sector divide, which is a cool concept. As the public sector, you’re responsible for the details of deploying your army and directing the overall trade policy; the private sector kind of runs its own show, you can’t micromanage them, but will need to look after their needs if you want to reap the benefits of their productivity. Managing aliens, though, can be tricky, particularly in the context of trade. Aliens are somewhat analogous to barbarians in Civ or mindworms in AC, but also sort of act like their own independent faction, with slightly different rules; now that I think about it, a better analogy might be the native tribes of Colonization. Aliens are initially curious about your presence. They might just move around passively, or might try to attack you. If you are attacked, and you strike back, they seem to learn their lesson and will keep their distance. Now, if you continue to harass them, and particularly if you threaten their nests, they will turn hostile and will begin to swarm you like barbarians. But if you leave them alone, they will generally leave you alone as well, making it safe for your workers to head out and do their work. The exception, though, is trade convoys. For whatever reason, aliens seem to believe that these convoys are absolutely delicious, and will munch on them any chance they get. I tried escorting them for a while, but even so they would end up getting destroyed. The trick to solve this is nonintuitive: you need to build an ultrasonic fence. According to the description, this will prevent any aliens from approaching within 2 tiles of your cities. However, as with all of the other buildings in CBE, some time after constructing your first ultrasonic fence, you will get a one-time quest event prompting you to choose an upgrade. One expands the range of the fence; the much more useful one is to make all of your trade units immune to alien attacks. After picking this upgrade, I quickly maxed out all of the available trade slots in all of my cities, and reaped massive economic and cultural benefits. Sadly, my attempt at a completely passive game proved overly optimistic, as those dastardly Polystralians betrayed me and launched an invasion, despite previously being quite Friendly to me. I had virtually no military to speak of, so I desperately rushed some Soldiers in the city nearest the border, started rushing my two other Soldiers from their spots near the Capital to the frontier, and began purchasing some missile rovers and a tactical jet. Fortunately, even at this early stage in the game I had a very healthy bank account; if I remember correctly, the war struck during a lull when I had built all of the buildings available to my tech level in most of my cities, so I’d just been letting cash accumulate. Having barely played Civ V, and only limited wars in there, I was a bit nervous about how I would do in this conflict. From what I can tell, the rules of war are very similar across both games. Units have hitpoints, and it usually takes multiple rounds of combat for any unit to be eliminated. Your city also has hitpoints, and also strength; it can bombard nearby units, and must be attacked over multiple rounds to be defeated. Hostile units establish zones-of-control around them, and you can’t move more than one tile around a hostile unit after entering its proximity. The war was a desperate match, but I had a few advantages. Despite Hutama and me I both pursuing Harmony, only I had already acquired the tech that rendered all my units immune to miasma; so his units regularly dropped in health for every turn they stayed near my city. I also had that enormous bank account; while my units were one tier behind his, and were scrambling to reach the location of the fighting, I had much more capacity to reinforce myself than he did. My workers fled from the fighting, crossing paths with my incoming soldiers. Fortunately, a few of his units decided to pursue the workers rather than focus on the city. This allowed me to direct all of my limited firepower on attacking the units threatening my city. 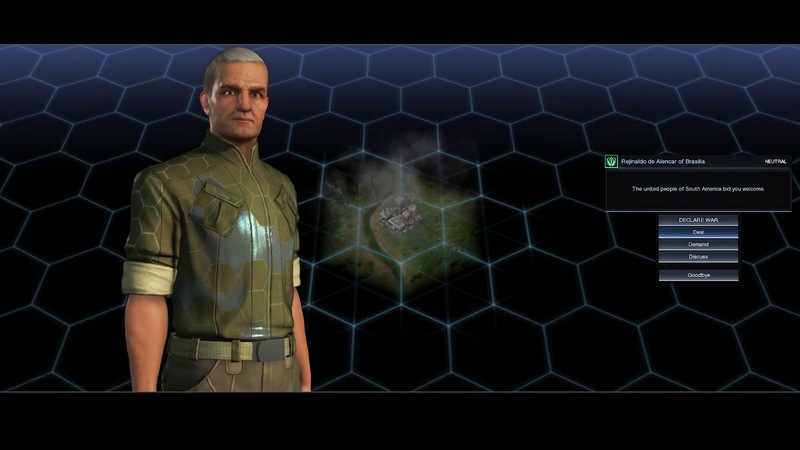 Combat in Civ V (and Beyond Earth) is rather famously rock-paper-scissors in its design. Artillery is highly effective against infantry, since they can launch ranged attacks that do a lot of damage at no immediate risk to themselves. Artillery is vulnerable to combat rovers, which can quickly chase down the distant units and force them into crippling melee battles. And rovers are threatened by infantry, who have straight-up better stats. So, even though I’m not exactly a combat expert, I was able to figure out an effective way to use my limited forces against Hutama’s assault. My city bombardment focused on the nearest units. Missile rovers drove into range, then launched ranged assaults on melee units. By this point, after their strength had already been weakened, I would unleash my tactical jet or a soldier to finish them off. When they set up their own missile rovers to start barraging my city, I treated it as a secondary threat - ranged attacks can’t capture a city alone; after the immediate vicinity was clear of other forces, I could send a combat rover after it and rush it. In the meantime, my workers led Hutama’s straying units deep into my territory; after we had secured our city, though, my newly-promoted force was able to easily crush them. And so, after some frenzied fighting, I had wiped all of those dastardly yellow units from sight. I now had a choice to make. Would I seek to end the war, and return my attention to my builder strategy? Or should I try and make Hutama pay for his treachery, and go after one of his own cities? It was a tempting thought, but I ultimately elected to opt for peace. While I was happy with how the battle had gone, I knew it would be much more challenging once I started going after his core, especially since I’d not only neglected my military units, but also my military techs. Based on previous experience in Civ, I expected that I would be able to get favorable treaty terms after the solid thrashing I had delivered (crushing all six of his invading units while losing none of my own). I opened up negotiations with a humiliating demand: all of his energy, plus additional reparations each turn. No dice. I began dialing it back, gradually lowering my demands to find the highest he could bear. He stood strong. Annoyed, I offered a straight-up peace. He refused. Out of curiosity, I asked what he wanted for peace. He demanded the city we had been fighting over, plus tons of resources and energy! Pfah! Stunned, I sent him away. Why on earth would he be making such outlandish demands? It was almost as if he was utterly confident in his ability to defeat me militarily. But that was absurd; if he had greater strength, he surely would have led with it, rather than send a weak expeditionary force. Still, even if we technically remained at war, the immediate threat was past. My recently-marshaled army was ready to beat back any future incursions, and in any case he had only a narrow passable corridor from his territory to my own; now that I could keep an eye on things, he wouldn’t be able to sneak up on me again. Instead, I turned my attention to a more active threat: rampaging aliens! Like I’d said, after some early misunderstandings I’d worked things out with the bugs. However, this detante did not extend to siege worms. Two of them, highly agitated, had appeared in my territory right as my war with Polystralia began. I’m still not sure if this was coincidental or not; given Hutama’s love of affinity, I suspected he might have influenced this threat to my rear. I’d ignored the worms during the main war, but in the meantime they had pillaged my vital road connection, damaging the connection between my capital and cities and harming my economy. Unfortunately, taking down the worms was no simple task. Siege worms have a ridiculous 60 Strength, against my marines’ pitiful 14. A single worm, let alone two, would have no trouble crushing my entire army. Around this time, Hutama came back to me, asking for peace. I repeated my punishing terms, and this time around he accepted. I was a bit surprised, since we’d had exactly zero interactions since our previous negotiations, and as far as I could tell nothing significant had changed. It does make me wonder if the AI only re-calculates its relative power at certain intervals, or if perhaps it keeps a rolling window of power metrics that only gradually updates. Regardless, I was pleased to bury the hatchet. Despite his shocking betrayal, Hutama and I shared many good reasons to cooperate (including our mutual affinity and numerous trade routes), so I felt optimistic that he had learned his lesson and would leave me in peace, much as the aliens had learned their own lesson early on. That optimism proved, well, overly optimistic. He betrayed me again almost a century later, again with little warning and no provocation. I resolved to wipe him off the face of the Earth… well, off the face of whatever this planet’s name was. Once again, I tapped my ridiculously large energy stockpiles: “Buy me an army!”, I bellowed. And so they came, and I fought, and it was good. There’s so much that I love about the affinity system, and one major positive aspect is how well integrated it is with the mechanics of the game. When it comes to combat, your affinity choices will have subtle but profound impacts on the style and look of war. For example, as a Harmony player, many of my units had a unique ability where they gain 40% additional strength when not adjacent to a friendly unit. This encourages a very different style of combat: Harmony players are strongest when scattered, whether because a lone unit is fighting on after its comrades have died, or because they are swarming you from all directions. This has a very different visual look from the sleek, unified front lines you would see when facing a Purity or Supremacy player. That does cause some potential problems: in the most typical combat configuration, you would want your shock-troop soldiers in the front line, and ranged missile rovers or rangers in the rear line backing them up; but you’re effectively cutting your potential strength (both offense and defense) by 40% in this configuration, so you need to choose between a disciplined formation that negates the upgrade, or a more powerful loose configuration that puts your ranged units at greater risk. Fortunately, by the time of the Second Polystralian War, I had upgraded to the top-level Harmony artillery units, Minotaurs, which have an incredible range of 3 tiles. So, my Marauders could still form a good front line, and get support from the rear, and each fight at maximum effectiveness. Furthermore, many top-level units like the Minotaurs have thrusters that cause them to hover over the ground; as a result, they could move through hilly terrain very quickly, and even float over canyons, which until now had been completely inaccessible. Hutama’s forces fell quickly in the beginning; once again, he didn’t seem to have the boots on the ground to back up his violent aims. As before, I initially focused on beating back his assault, and then on eliminating his units; now, though, I followed up by moving into his territory. This war was mostly fought along the eastern border of his realm, in contrast to the First Polystralian War, when he had sent troops north and attacked the middle-west of my country. Many of Hutama’s cities had been abandoned militarily, and put up little resistance. I decided to burn all of his cities: I was reluctant to take the Health hit for absorbing them into my nation, and didn’t see much benefit in installing a puppet government. Unlike previous Civ games, burning a city isn’t instant: instead it lowers the population by one person per turn until the city is destroyed. If this had been our first war, I would have held on to them and then given them back in a peace deal; however, since he had already proven himself untrustworthy, I had no plans to ever offer peace. The war got a bit tougher once he was down to his last few cities; I think that he got a few extra Harmony points after the war started, which allowed him to upgrade some already-veteran units to match my top-level builds. He was actually really clever in using his fast units to chase down my vulnerable Minotaurs, and the war ended up being surprisingly close, with him tenaciously holding on to his final city while I had to split my forces between defending not-yet-wholly-burned cities and pressing the assault on his very powerful final stronghold. Along the way, though, I had yet another AI annoyance. In an earlier war, Hutama had captured the capital and several other cities from Kavitha Thakur of the Kavithan Protectorate. Rather than burn these, I opted to return them to the Kavithans; they were so weak that they didn’t pose a threat, and I figured some goodwill would be appreciated. She thanked me profusely, and I got a nice diplomatic benefit. On my VERY NEXT TURN, she appeared before me, irate, demanding that I remove my troops from her territory. Um… you mean, those units that just freed your city? The ones who are the reason you’re here at all? I chose the second option, truthfully saying “We’re just passing through” - which was true, they were all on the way to Hutama’s final city, which happened to be another of Kavitha’s captured cities, and another one I was planning to liberate. The next turn, she showed back up, irate, canceling our open borders agreement, censuring me before the world, and turning hostile towards me. I was speechless! There’s a lot of buggy diplomatic AI in this game, but this was by far the most egregious: someone who should have been my friend, irrationally lashing out at me, destroying our relationship AND her own self-interest. Because her border was closed, I now needed to go the long way around a mountain range to finally reach Hutama’s last city. I almost burned it out of spite, but at the last minute decided to give it back to Kavitha after all. She seemed to appreciate it, but not enough to be friends again. Grumble, grumble. The AI in general got pretty frustrating around this point. A lot of people were denouncing me for being a warmonger. Which is, you know, just patently untrue. I’d never initiated any wars. I’d never provoked any wars. Granted, I was burning all of Hutama’s cities to the ground; but if that’s what they were upset about, then they should have complained about that, not lying about me being the aggressor in the conflict. 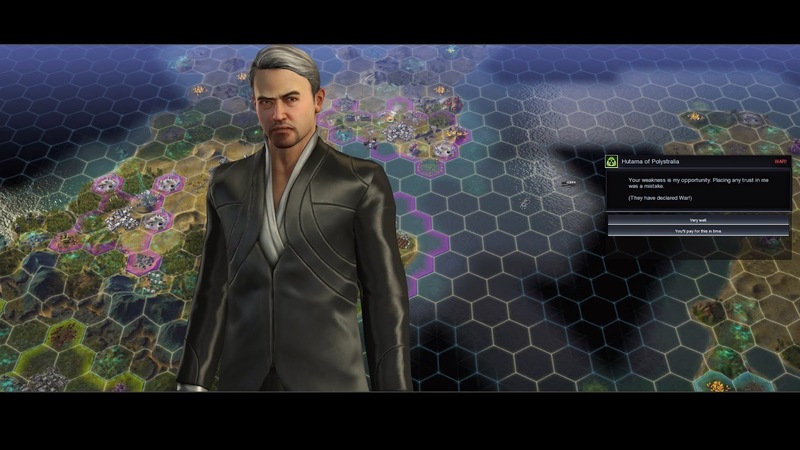 While I enjoyed Beyond Earth, the farther I got into the game the less polished it seemed. Beyond the janky diplomatic AI, I had a shockingly hard time figuring out how to get the Transcendence victory. From the Civilopedia, I knew that I would need to build a Mind Flower; but the Civilopedia didn’t list what techs I needed to research in order to build it. I spend an inordinately long time trawling through the Tech Web, and searching the Civilopedia directly, and just could not find out what I needed. I ended up needing to Google it and hunt through several forum posts before finally finding the answer. Frankly, it felt ridiculous. I don’t think over Affinity victories are this messed up, but it felt like a really gaping oversight. 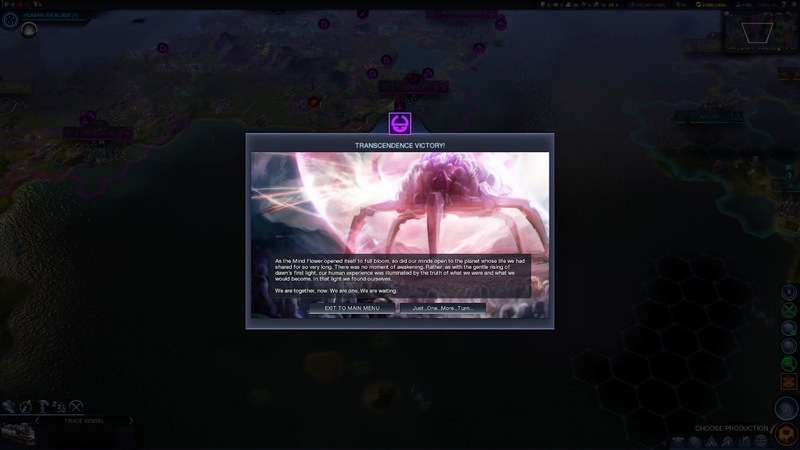 For the Transcendence victory, after you build research the requisite techs, you build the Mind Flower, a big Project that consumes a tile in your territory. You then need to defend it, as all alien life on the planet turns hostile towards you. I thought that was a really interesting wrinkle: thematically, most Harmony players are probably likely to try to live in, well, harmony with the native life, and so may not have invested in the anti-alien technologies that other players will have. Still, it was really easy. Even though they turn hostile, the hypersonic fence is still effective at repelling them, so they never came close to threatening my borders. I did appreciate that my human opponents didn’t gang up on me: in previous Civs, it’s very common for the entire world to declare war on you if, say, you start launching your spaceship to Alpha Centauri. The other players were more hostile to me at the end, but I couldn’t really tell if this was due to me approaching victory, or more bold in my covert ops against them, or their miscomprehension of me as a bloodthirsty warmonger. Regardless, I was happy that the game didn’t force me to fight a big war at the end of what had been a fairly pacifistic path to victory. As with Civ V, winning a game is incredibly anti-climactic: you see a still image, and a few sentences of text, and that’s it. I shouldn’t have been surprised, but after that excellent intro video, I’d foolishly allowed myself to hope that they would show something of similar quality (if shorter length) as a reward for the long time it takes to win the game. I continue to feel befuddled at just why they have relapsed so far from the triumphant, uplifting victory sequences of Civilizations I, II, Alpha Centauri, III and IV. They’ve even gotten rid of the most basic classic aspects of victory, like replaying the game in strategic view; there’s still a graph view at the end, but it’s deeply buried within the main menu. I dunno. I wonder if it’s a purely financial decision, or a stylistic one, or what, but out of all the things I miss from Civ IV (a very long list!) this is near the top. Here’s a rundown of my opinions after my first full game! Affinities! The whole affinity thing is really colorful and flavorful, and nicely unites purpose, mechanics, and visual design in a really attractive (but compact and comprehensible) whole. Choices, choices everywhere! It’s actually kind of ridiculous: every time you build a new building, or reach a new affinity level, or do one of the dozens of quests, you’ll get a popup asking you to make a decision on something. This will have lasting effects on your game, typically changing the outputs of a building or a tile upgrade or certain unit types in your military. Because every choice is independent with every other one, there’s a ridiculous combination of different outcomes, many of which will be perfectly viable depending on your situation. Lore! It’s easy to just click past this, but any time I pause and actually read the quotes and descriptions on the Civilopedia, I’m really impressed. I feel a bit like how I imagine a Renaissance genius would feel listening to a podcast from the 21st century: it’s comprehensible, while still being fantastical enough that my mind has trouble absorbing it. Music! It’s maybe slightly less iconic than the awesome tunes in Civ IV, but still one of the best soundtracks of any Civ. The tech web! It’s radically different from earlier Civ games, and yet works really well. 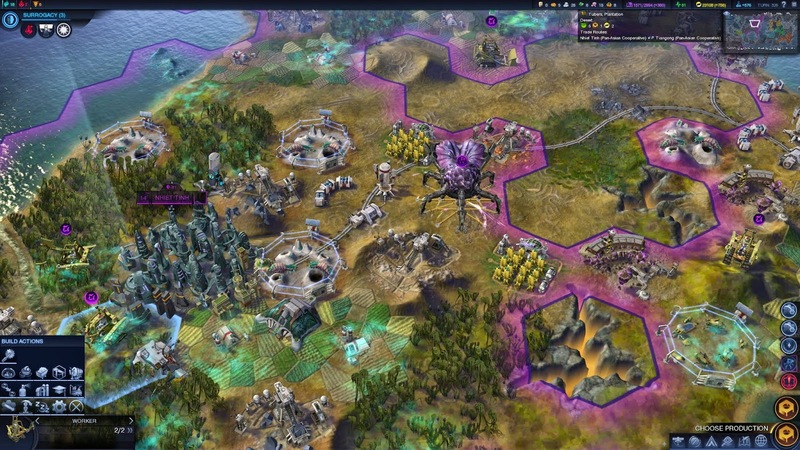 Tech choices now feel even more significant than before: in previous Civs, you were really only worried about the order in which you would discover things; now, you’ll definitely finish the game without ever getting a whole bunch of techs. But, because the web is shallower, it’s simultaneously easier to pivot if you realize mid-game that you need to pick up an unexpected tech. Searchable civilopedia and tech web! Especially in my first game, when I didn’t always know what type of thing I was looking for, it was really handy to be able to just type stuff in. Leader personalities! It’s fun to see the Affinities eventually mark their followers. I also liked the way that, for example, a leader would occasionally mention that they were happy that we were in a mutual group of friends. Unit evolution! This is another drastic change from Civ: instead of specific techs unlocking specific new units, and you needing to upgrade old units to new, earning enough affinity points will give a free upgrade of your choice to all existing instances of a given unit. So, there’s never the problem of updating your field military. It makes more sense than ever before to invest in early military units, since later ones will grow more expensive. Aliens! I liked their general “we’ll leave you alone as long as you don’t spook us” attitude. It’ll be interesting to play as a more aggressive player later and see how that changes things; I imagine it’ll lead to more of an arms race, as your own units will become veterans more quickly but you’ll face increasingly hostile waves of bugs. Based on my limited battle experience, the enemy combat AI seems pretty smart. Perhaps bad at the strategic level of making decisions about when to go to war, but effective at managing its assets in a fight. Trade routes! They’re very lucrative, arguably too much so; I wouldn’t be surprised if they get nerfed in a future update. I like how they also lead to diplomatic bonuses, which often incentivizes me to pass over a more-rewarding route for one that offers me a more strategic relationship. There are good choices to make between internal and external routes, and in general I like the level of activity involved in setting up routes (which reminds me a little of the soft-touch hands-on involvement with spreading religion in Civ IV): you make some initial decisions around setting up your trade routes, but don’t really need to micromanage them. Wonders seem less powerful than in previous Civ games; they’re still fairly expensive, but there are a lot of end-game Wonders that cost over a thousand Production and only grant, say, +4 Culture and no other benefits. Cash is king. I’m used to running at a minimum bank balance, or hoarding my reserves for emergencies, but in the Energy economy it’s trivial to stockpile an enormous reserve, which you can and should expend. I generally tried to maintain reserves of around 10k Energy (which has good synergy with a Prosperity Virtue), and spend the surplus on buildings. But it’s also very useful for rushing an army if you’re attacked, or acquiring tiles if you suspect a rival of making a land-grab. In general, I really like the idea of “favors”. It always bothered me in previous Civs when a rival would demand me to give them something for free, and then get upset when I told them “no”. Psychologically, I’m much more willing to acquiesce if I’m getting anything back, even something as insubstantial as “favors”. That said, favors are very insubstantial indeed. I had initially thought that these would be general diplomatic modifiers, and that by collecting enough favors I would be able to maintain friendships for longer. Instead, though, they’re just another resource to trade, and apparently not a very valuable one anyways. I’ll probably be much less likely to accept favors in any future games. The Civilopedia (or whatever they’re calling it) is frustratingly incomplete. I ended up winning my game many decades later than I could have, just because the Mind Flower page didn’t list the prerequisite techs. There are very few internal links between pages, and very few deep links into the Civilopedia. Man, I really miss the glory days of Civ IV when you could right-click on pretty much anything in the game and be taken to the relevant page. I do like the search function, but in all honesty, probably 90% of the time I was typing, it was because I’d seen some text that wasn’t clickable that I needed to check out. Along similar lines, while I love unit evolution, it’s seemingly impossible to find the actual stats on any given unit. Even for my own units, I would occasionally get confused (especially after several evolutions) about their powers and abilities. As noted above, the ending feels incredibly hollow and disappointing. Especially when the gameplay has been so polished and the setting so flavorful, the bare-bones victory screen feels borderline insulting. The diplomatic AI seems pretty buggy, unwilling to accept peace in one turn only to reverse itself for seemingly no reason shortly after, making bizarre demands, etc. The late game tech web is a mess. There are advances that cost the maximum amount of science to research, that only enable a single world wonder, which only gives (e.g.) +4 Culture and no other bonuses. There are a bunch of interface things that seem like weird oversights (and which I’m pretty confident will get patched soon). There’s currently no way to tell what building or unit a city has just finished building. There’s no sorting of trade routes, which gets particularly frustrating for coastal cities late in the game which can easily have 30+ available routes. There’s a “Previous route” choice, but it isn’t highlighted in any way and isn’t sorted anywhere in the list, so it takes just as much effort to hunt for this as it does to find the top-yielding route. I took a few screenshots while playing this game, which I have captioned and uploaded into the now-requisite album. There are a lot fewer for a strategy game like this than there are for my RPG albums! Still, if you want to check them out, that's where they are! 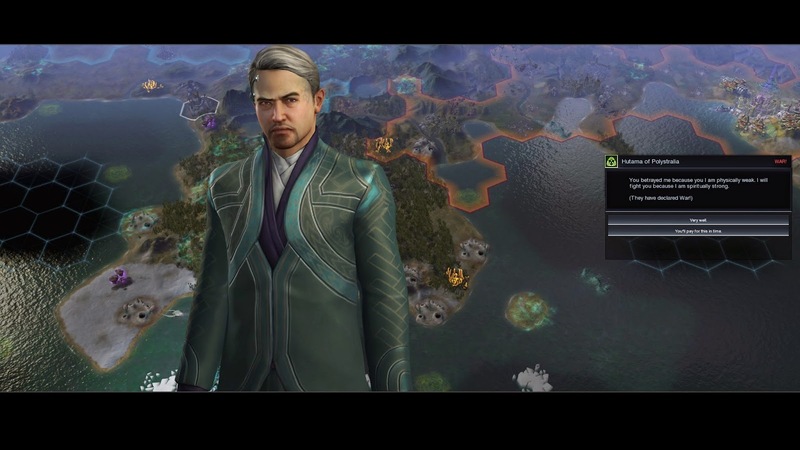 So, yeah… while the ending was a bummer, on the whole I really enjoyed Beyond Earth. It’s very evocative of Alpha Centauri while still confident enough to do its own thing. Some aspects of the game, like affinities, are really inspired. Things like the complete re-think of military unit progressions seemed like major changes to conventions that have been around in Civ for more than two decades, but ended up being wonderful innovations that solve problems I hadn’t realized the old games had. As my brother aptly pointed out, it isn’t going to dethrone Civ IV / Fall from Heaven II in our favorite-Civ-like-experience category anytime soon; but for me, it’s at least a significant improvement over Civ V, and something I’m sure I’ll try again in the future. If only they would add that little extra sense of reward at the end of the game, I’d be champing at the bit to dive right back in. As it stands, I’ll probably return to some deferred games for a bit and wait for them to patch this before I take another crack at it.